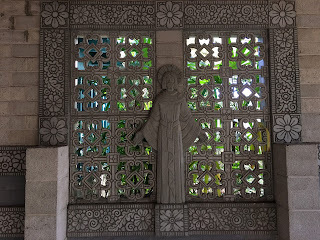 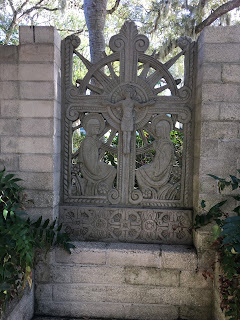 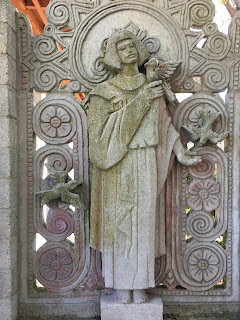 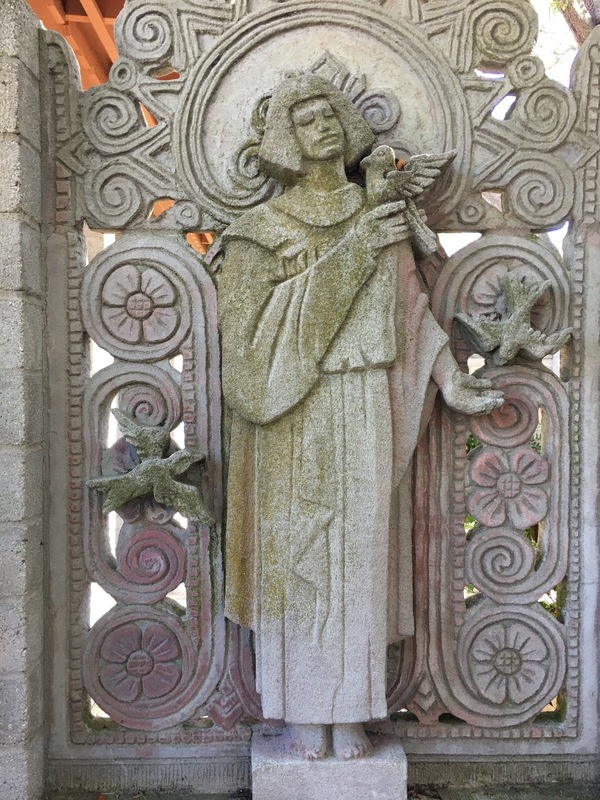 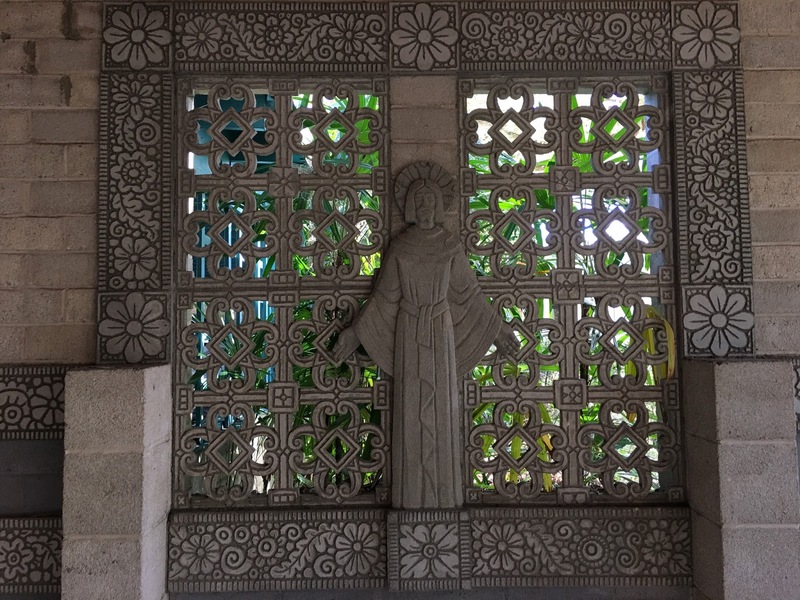 Smith's leg was amputated from a war injury, but rather than stop him, this situation galvanized a phenomenal amount of concrete bas-reliefs such as St. Francis, above, once polychrome, festooned upon the buildings. 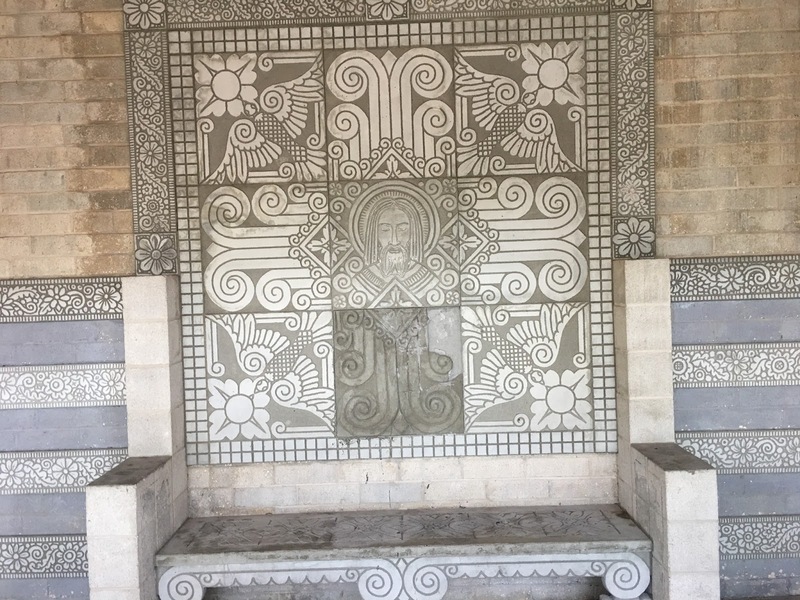 Smith designed a special table, which pivoted so he could carve the wet concrete with grapefruit spoons for the maximum amount of texture. Painted by a friend, the only contribution not by Smith himself. 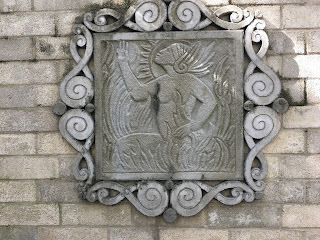 Though claiming intuition as a primary motivation, Smith was syncretic, and held an extensive library of works from different cultures. Born in Hong Kong, he relocated to Germany, then Connecticut, the son of a military officer who passed away young. 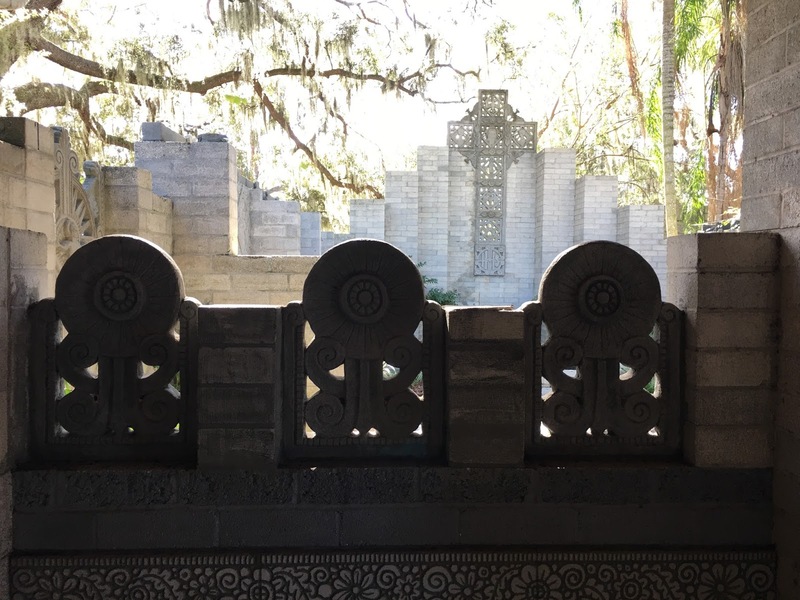 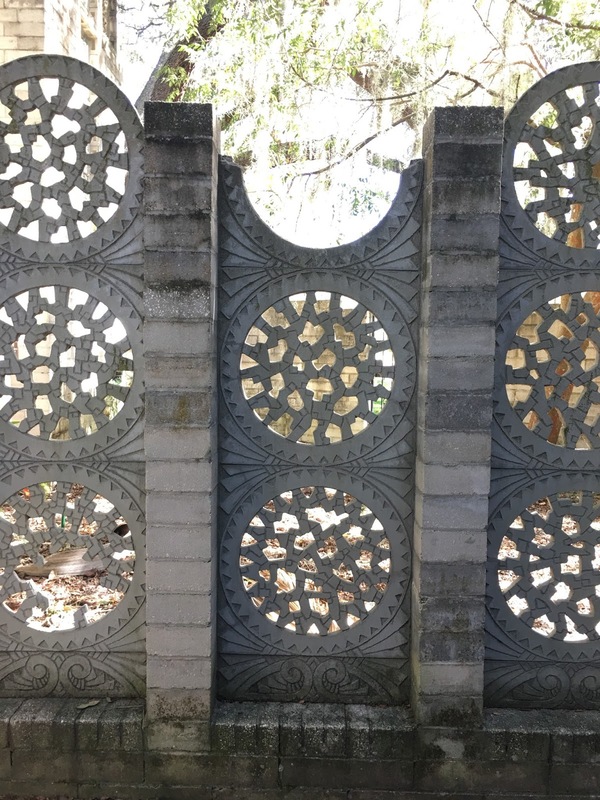 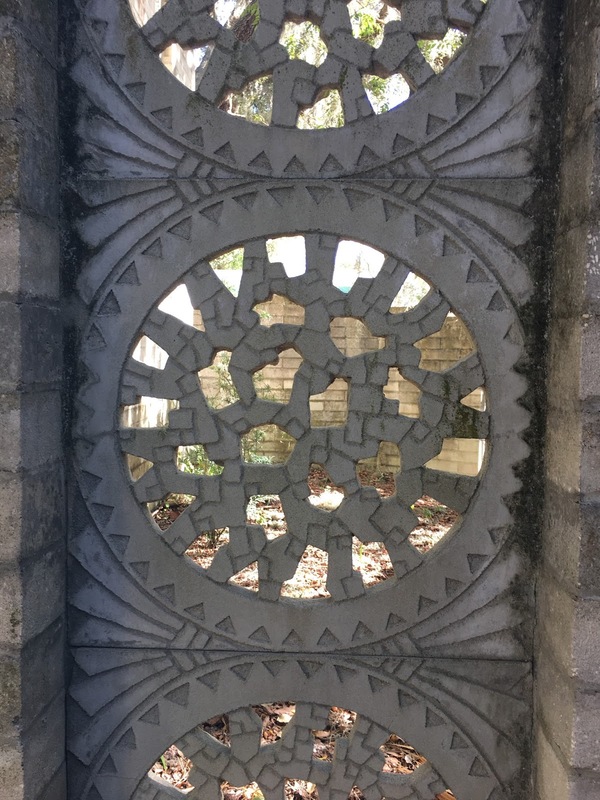 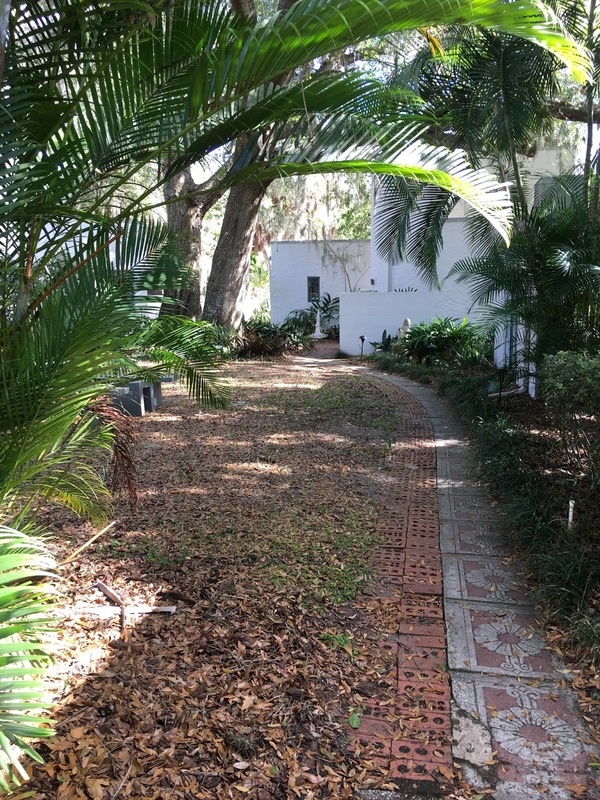 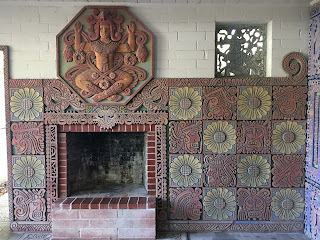 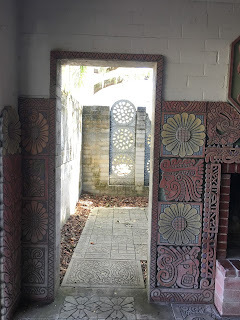 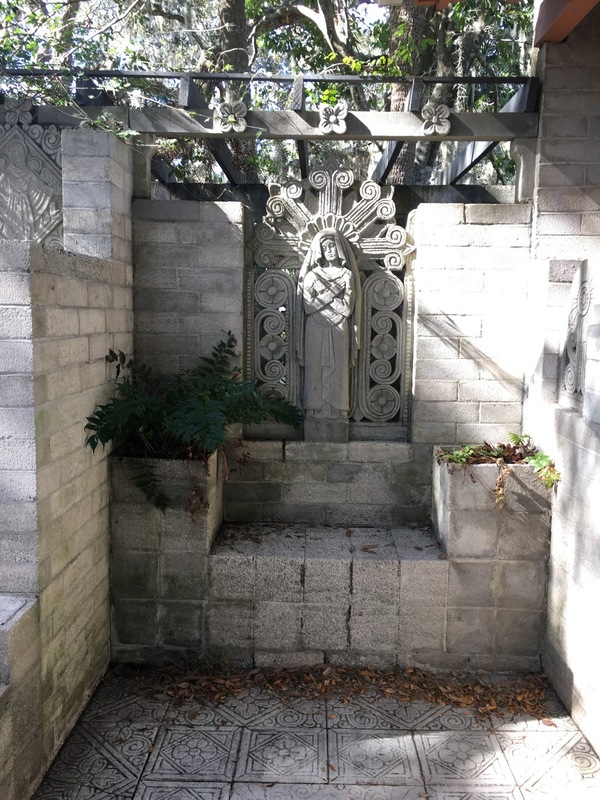 Smith worked as an architect in Manhattan before moving to Maitland, FL in his forties. 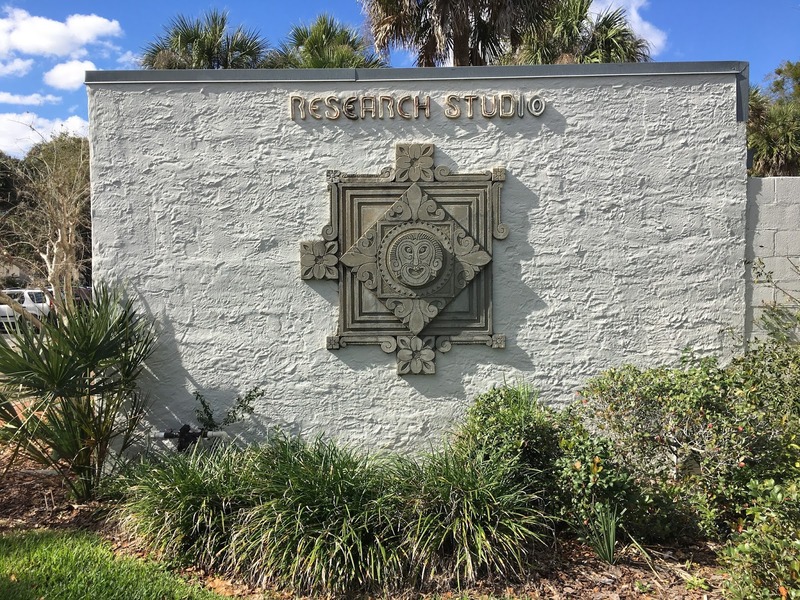 Across the street, the old home and studios now classrooms, AIR studios and administration. 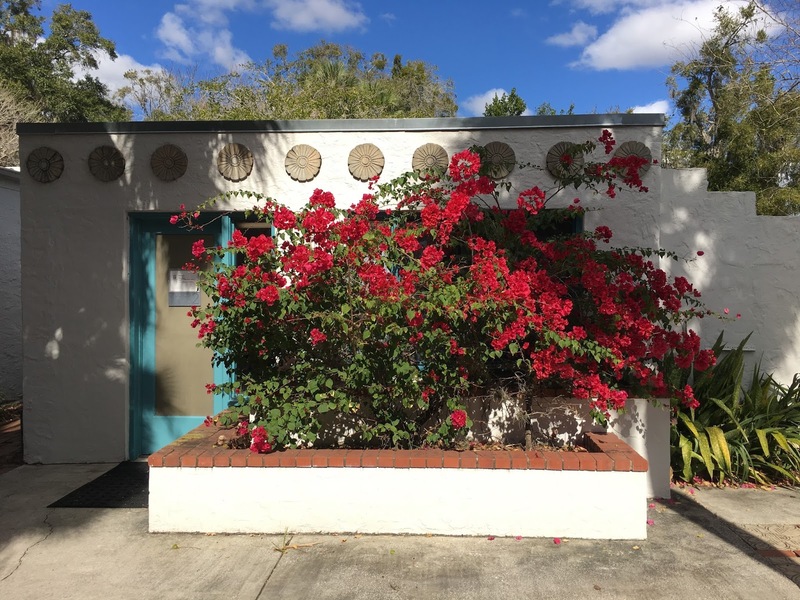 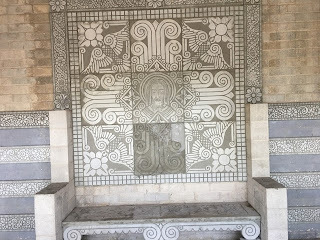 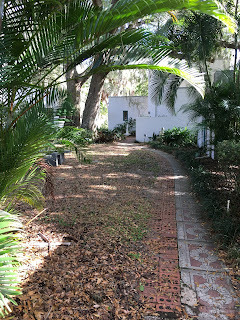 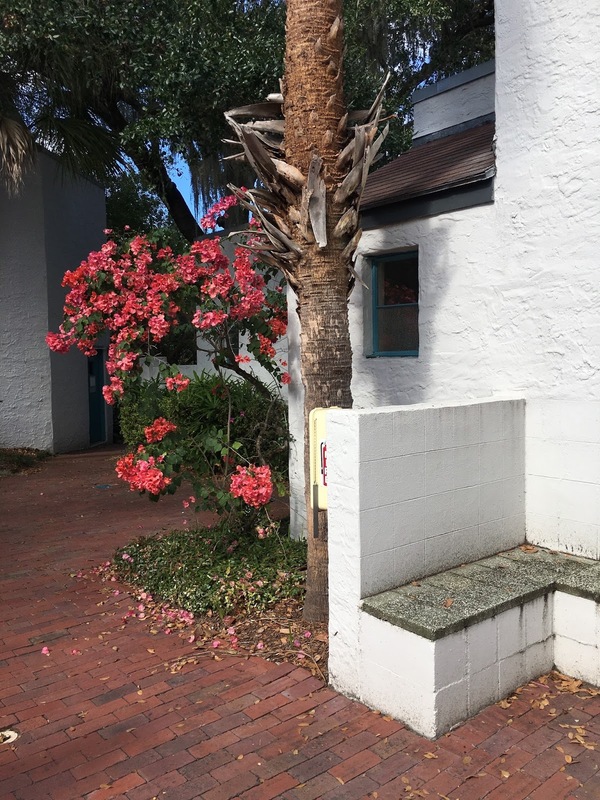 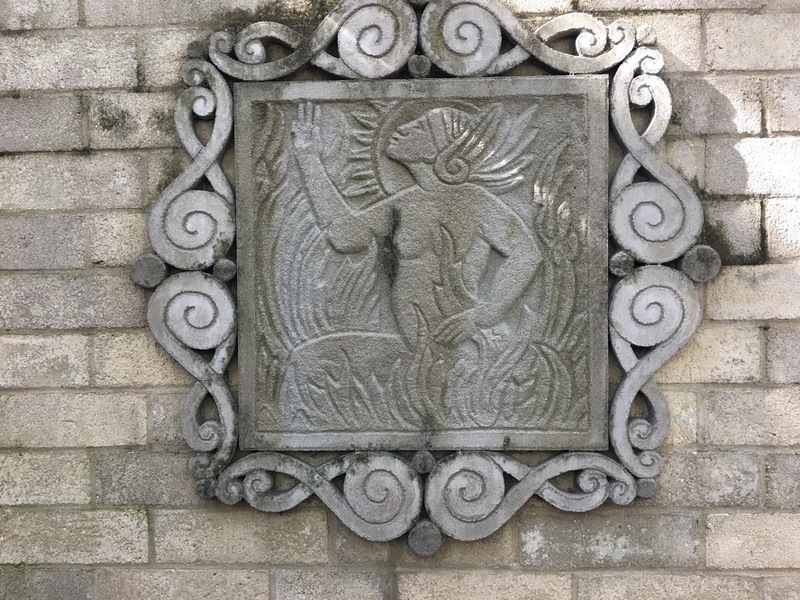 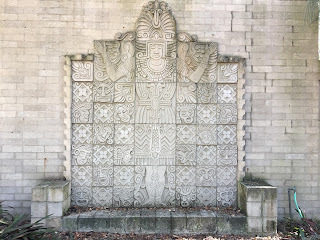 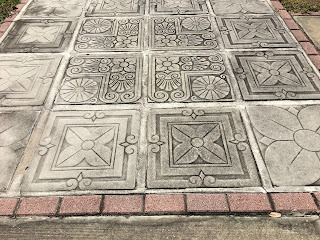 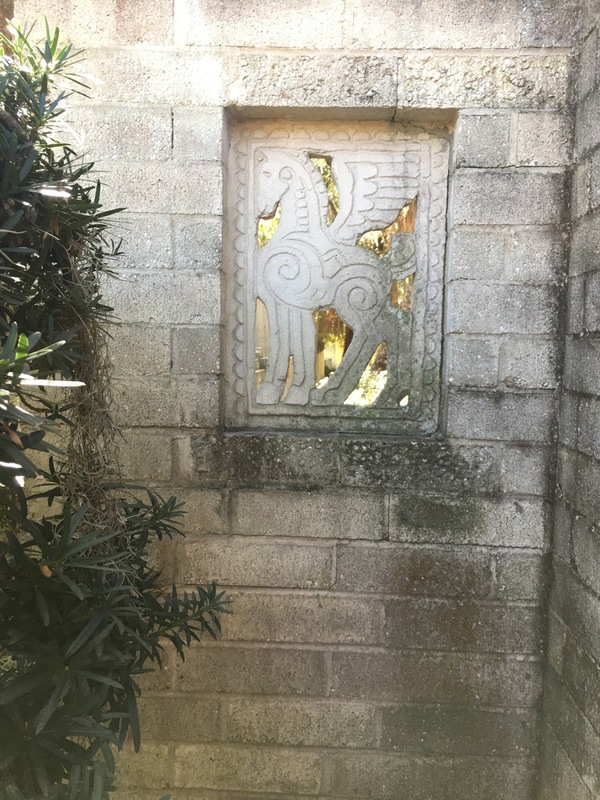 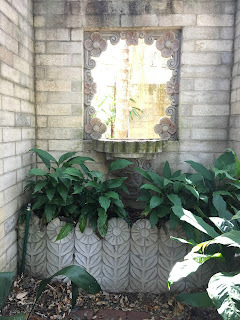 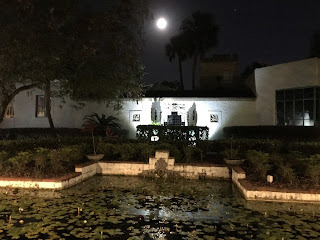 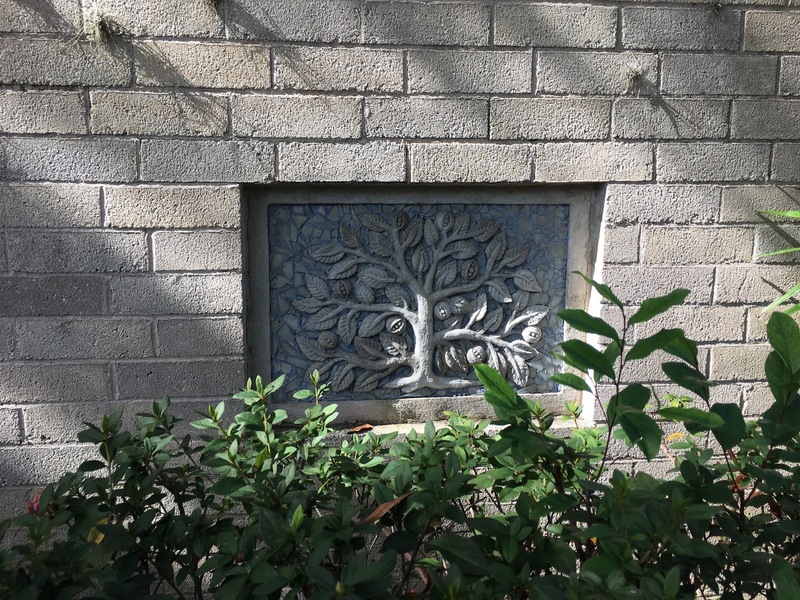 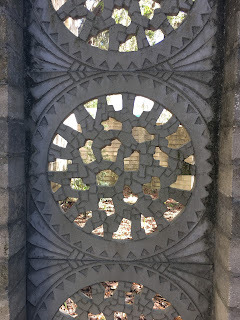 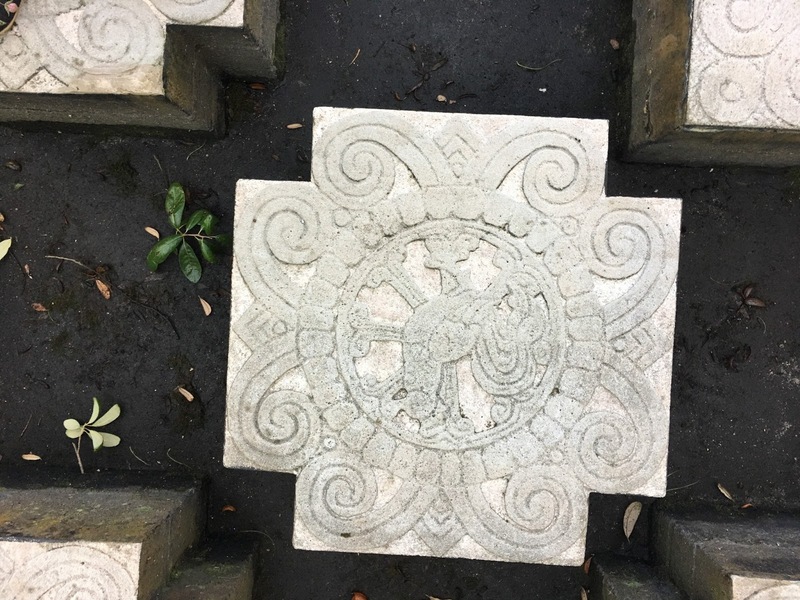 After his death, the colony fell into disuse until the city bought it in the 1960s; now it is lovingly restored and maintained by a dedicated staff. 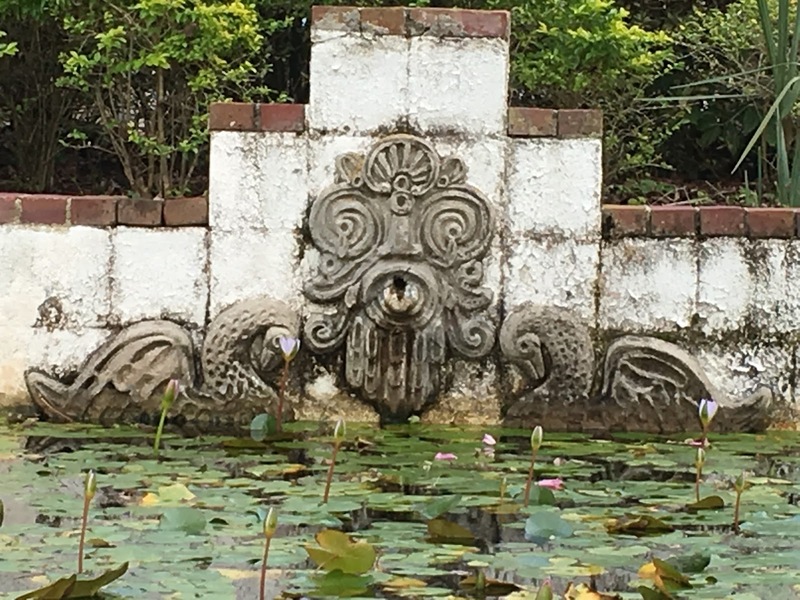 A pool of day lilies assiduously guarded. 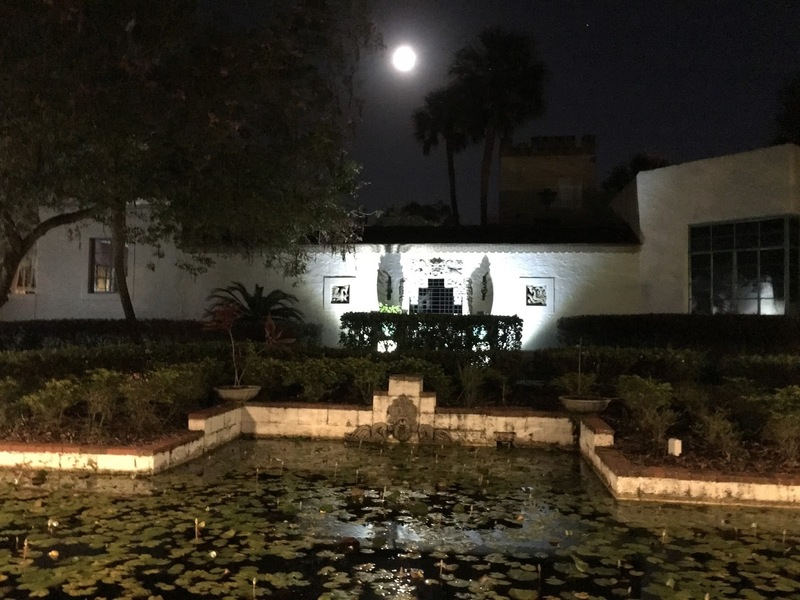 Under first full moon of 2017. I don’t usually look forward, I don’t even keep up, but there’s always some good painting at Sideshow’s annual group show. 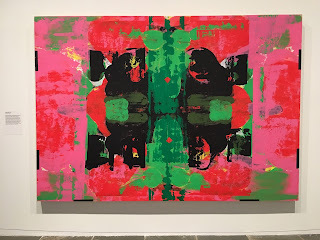 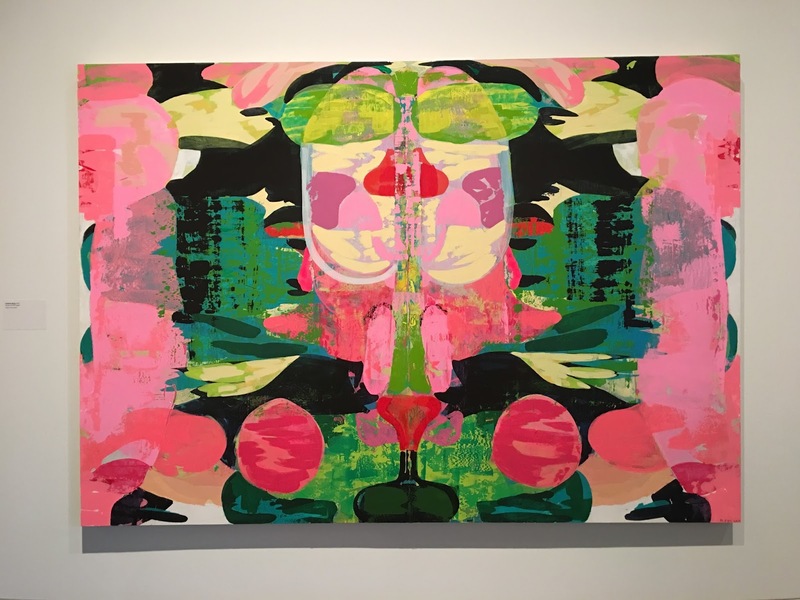 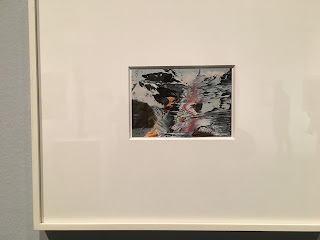 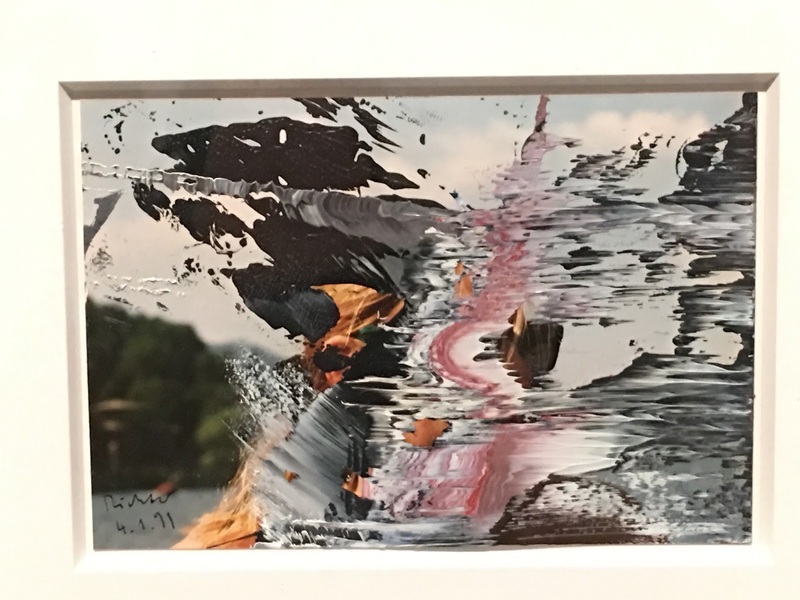 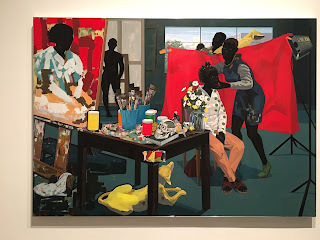 I’m also looking forward to Jack Whitten at Hauser and Wirth, Allison Gildersleeve’s paintings of nature at Asya Geisberg, seeing Kerry James Marshall’s “Mastry” again, Lynette Yiadom Boakye at The New Museum, “Visionaries:Creating a Modern Guggenheim,” checking out Two Coats of Paint and Raggedy Ann’s Foot to find out where the paintings are, the Asian Collection at the Met for new ideas (really)—and Centotto, Studio 10 and Valentine, to see what they are showing and to talk about art!" 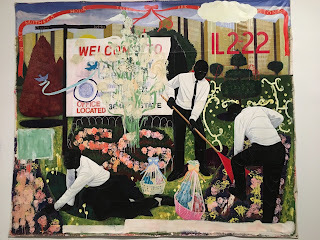 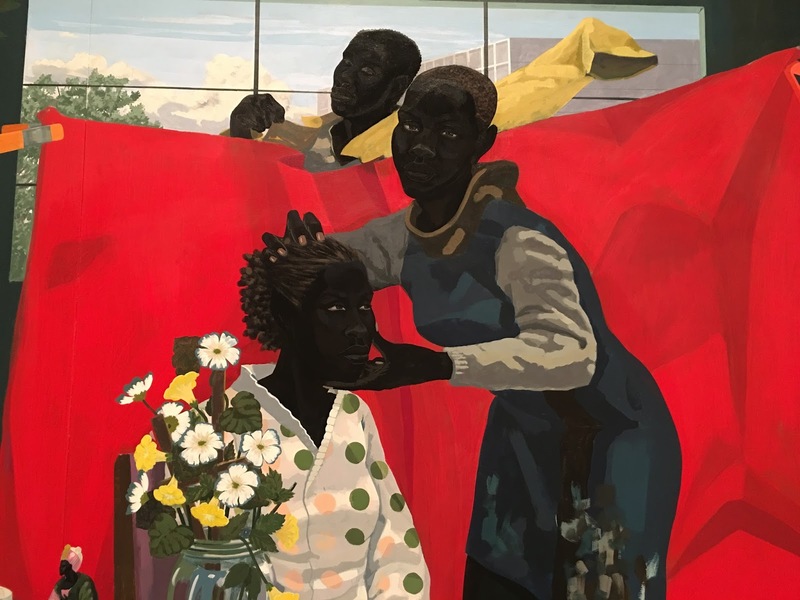 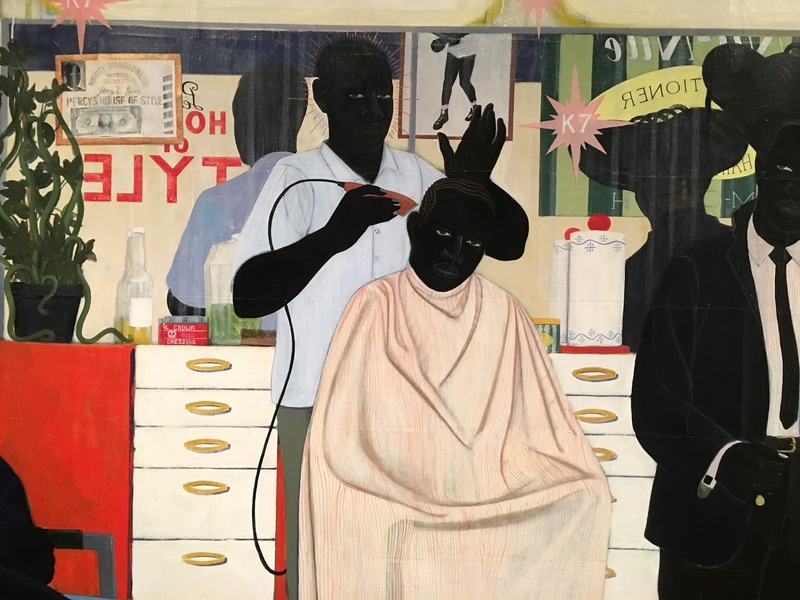 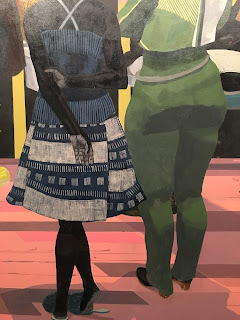 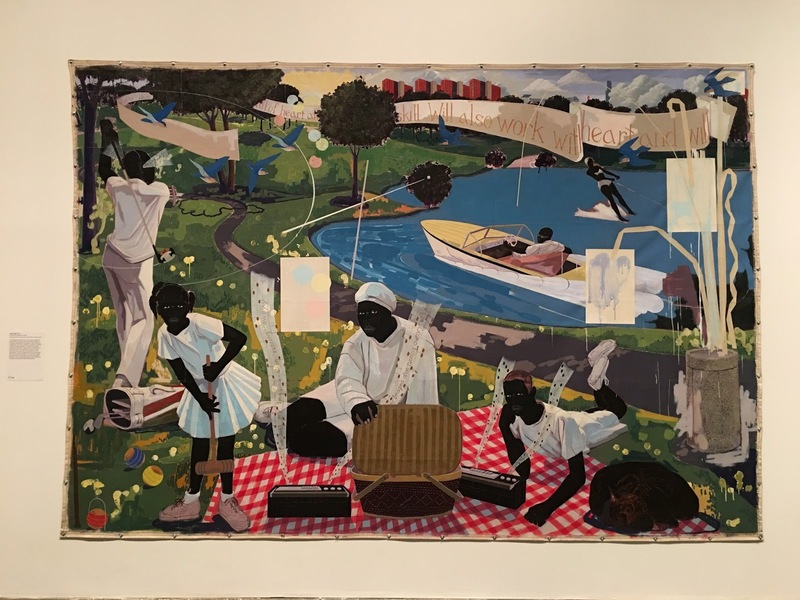 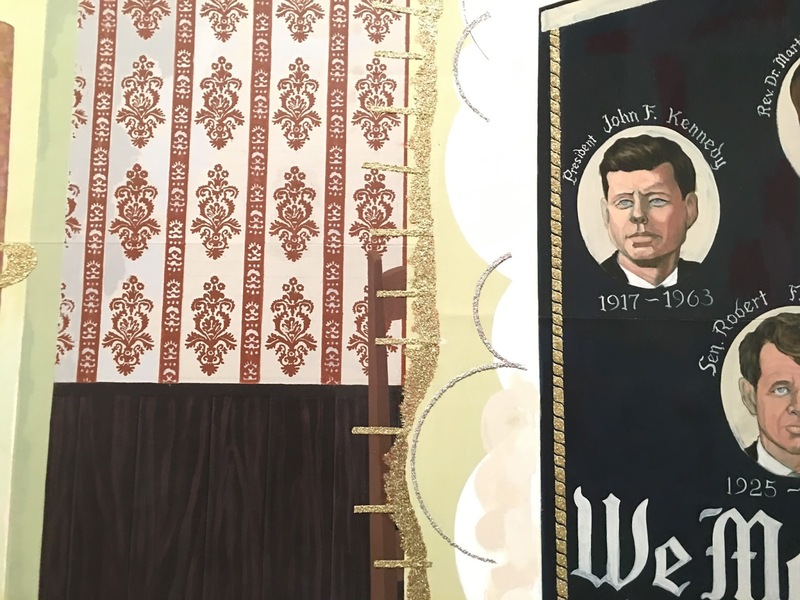 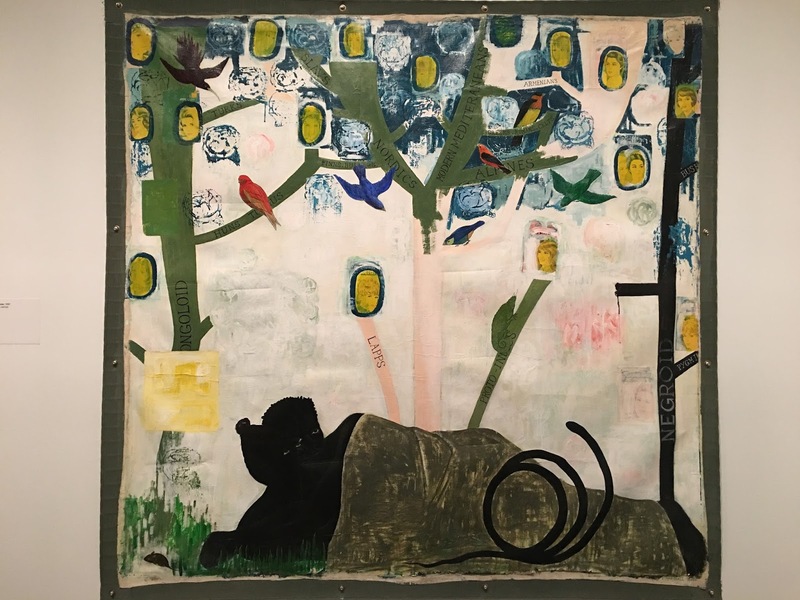 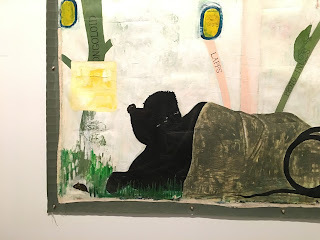 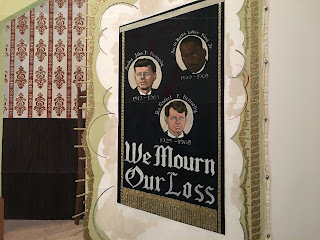 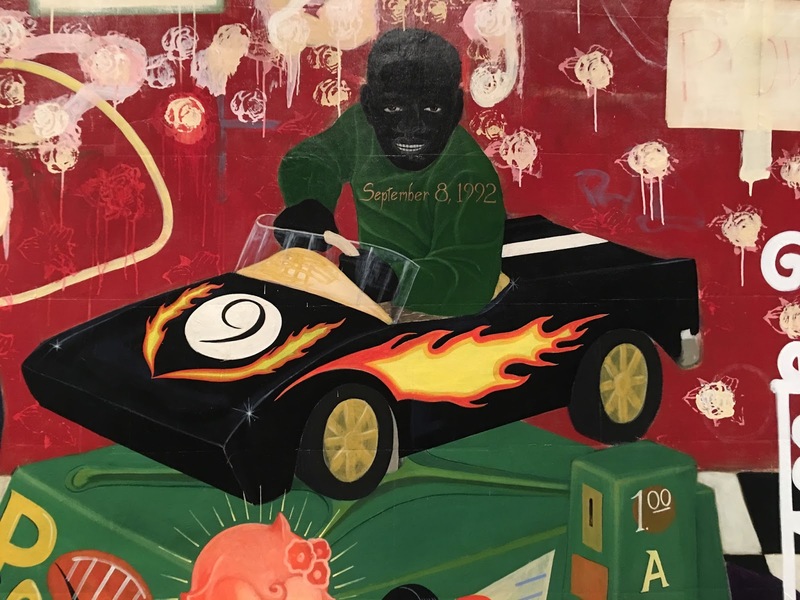 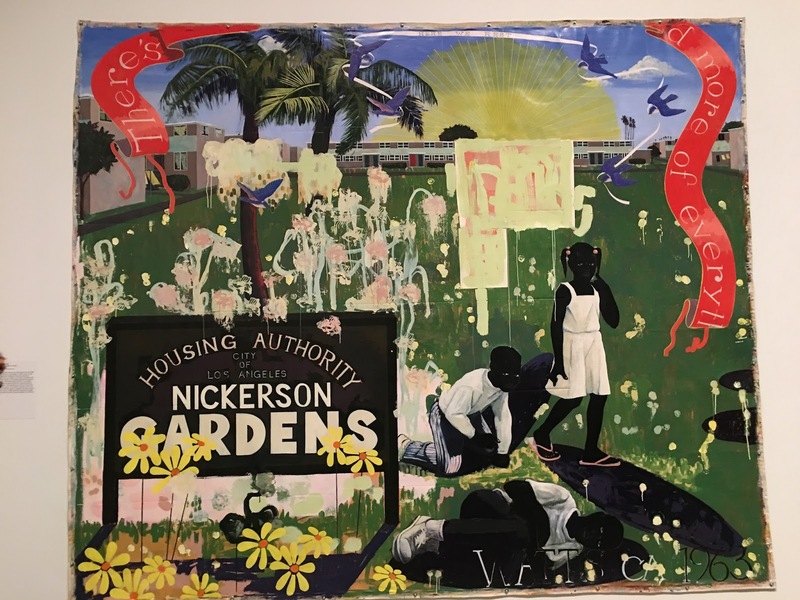 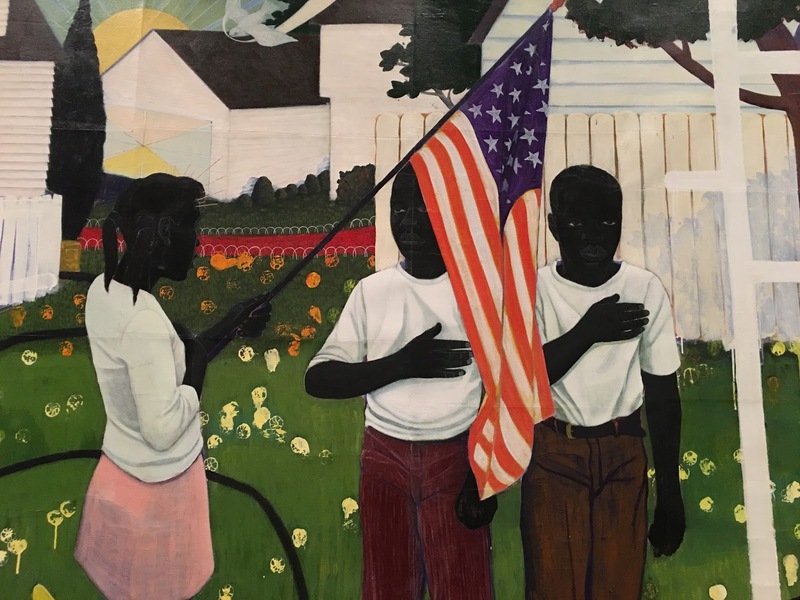 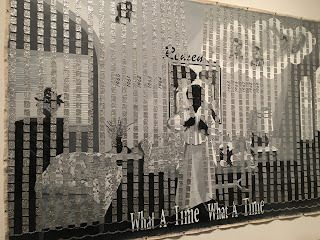 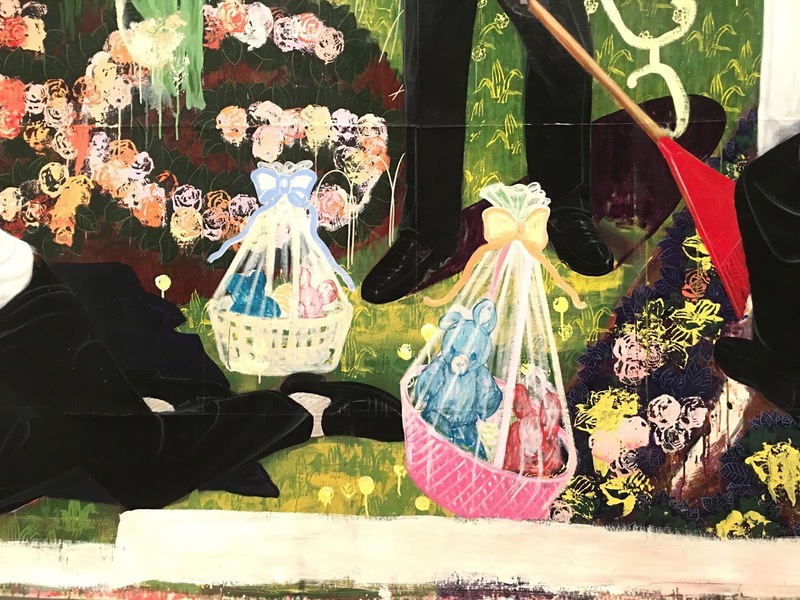 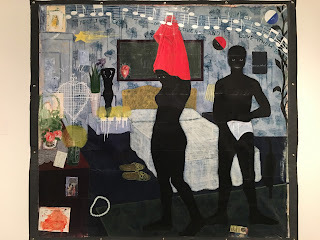 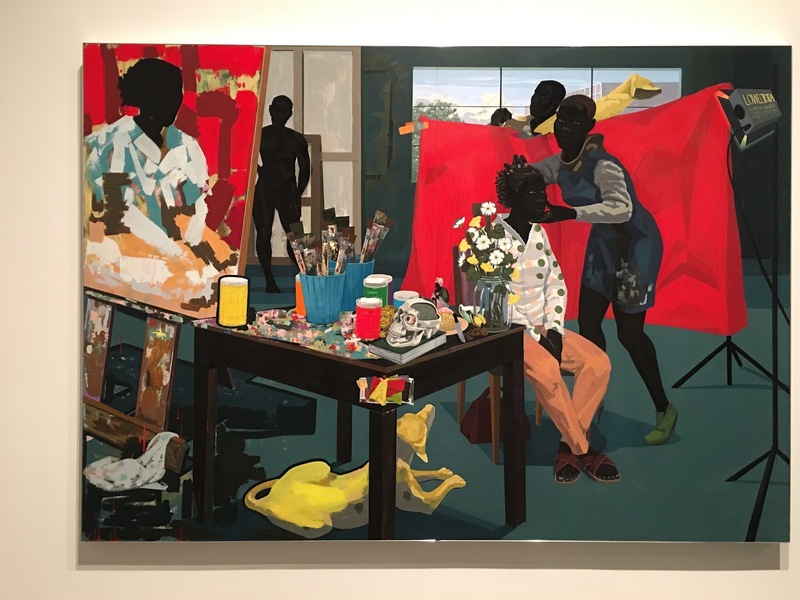 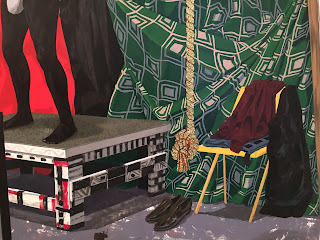 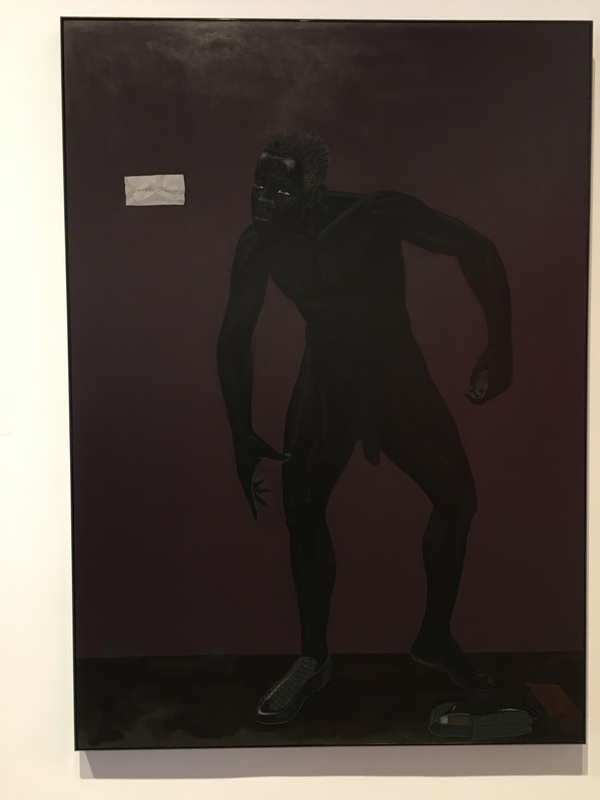 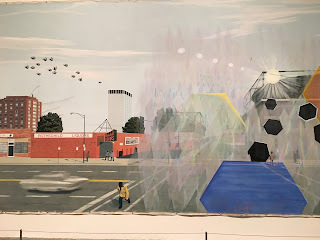 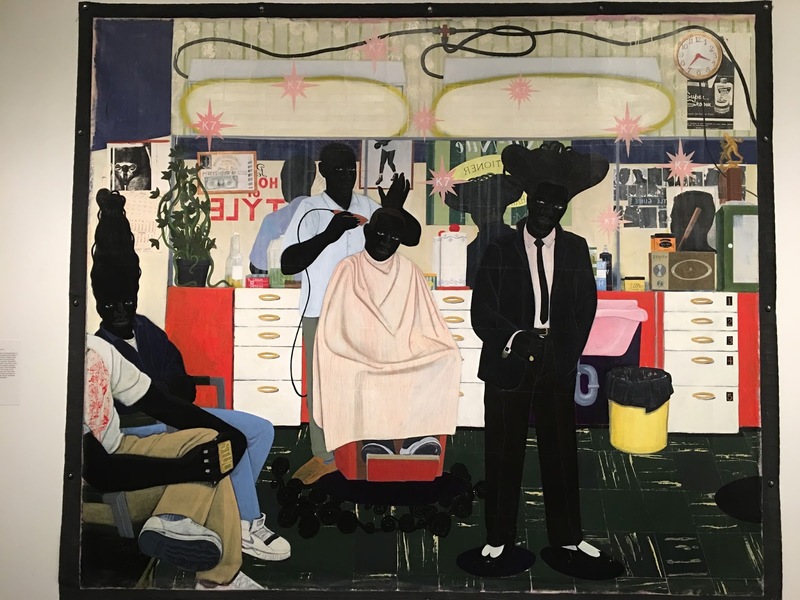 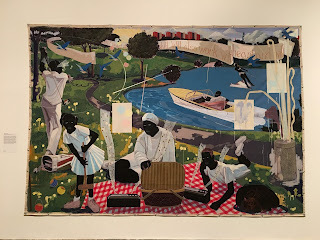 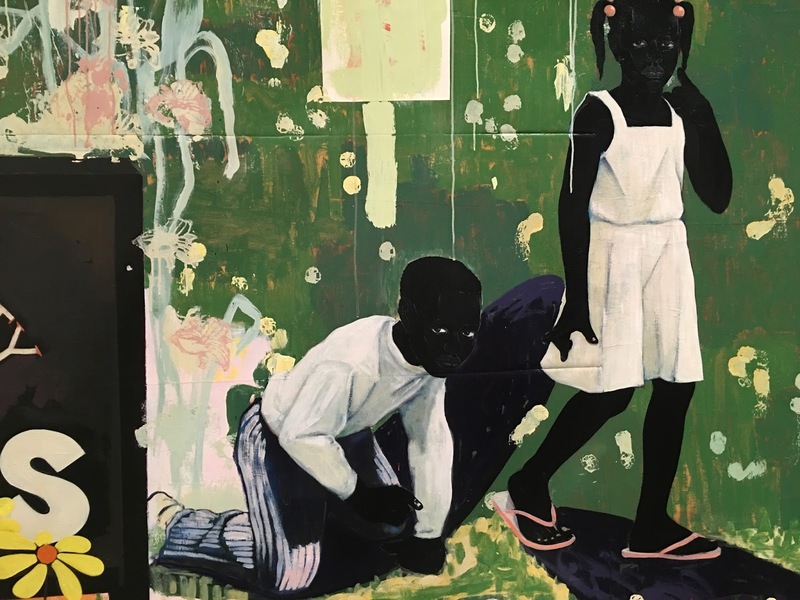 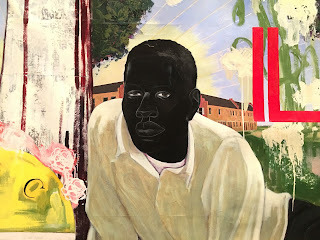 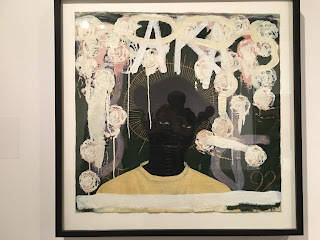 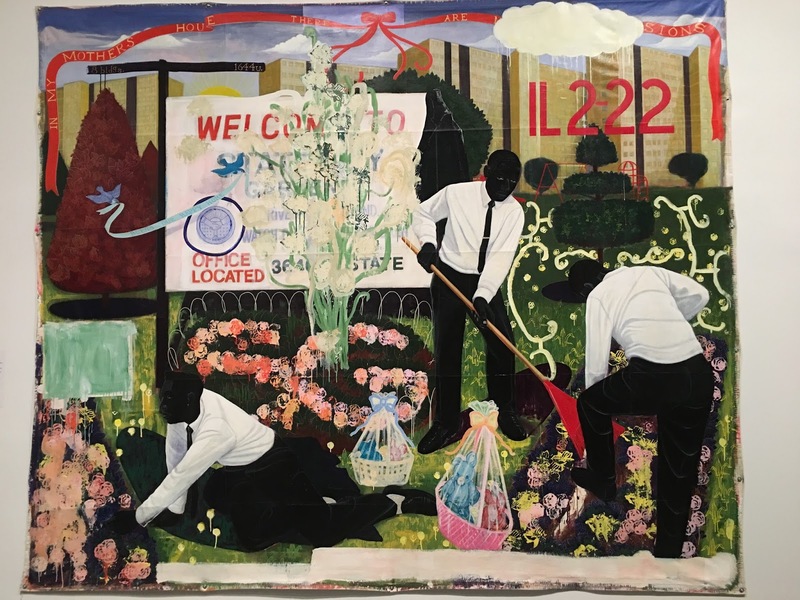 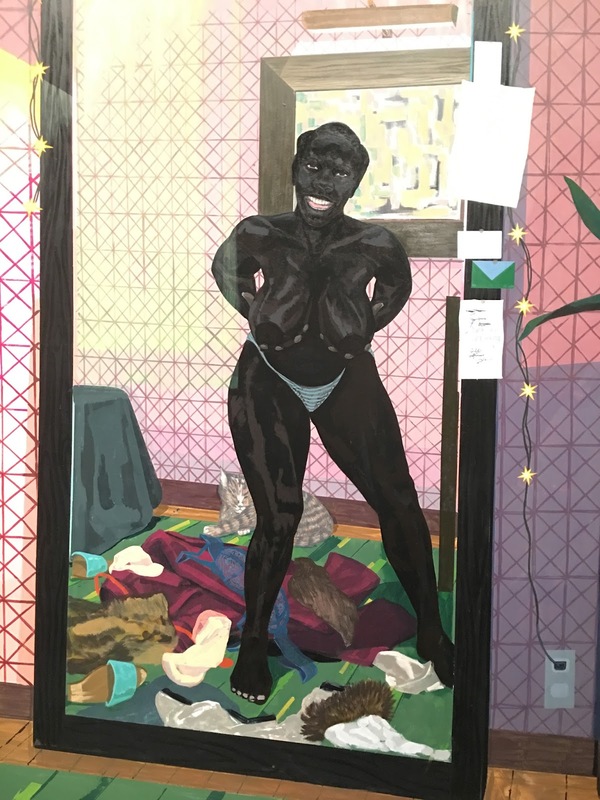 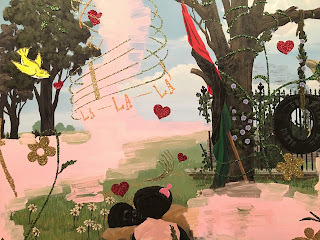 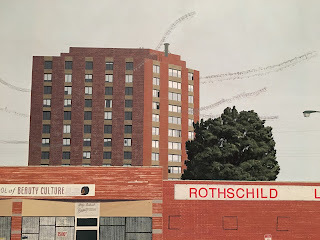 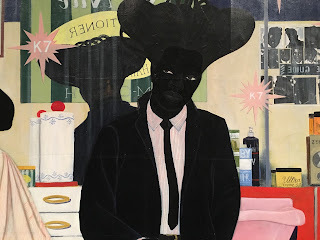 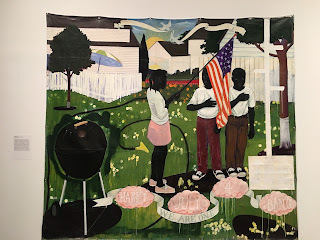 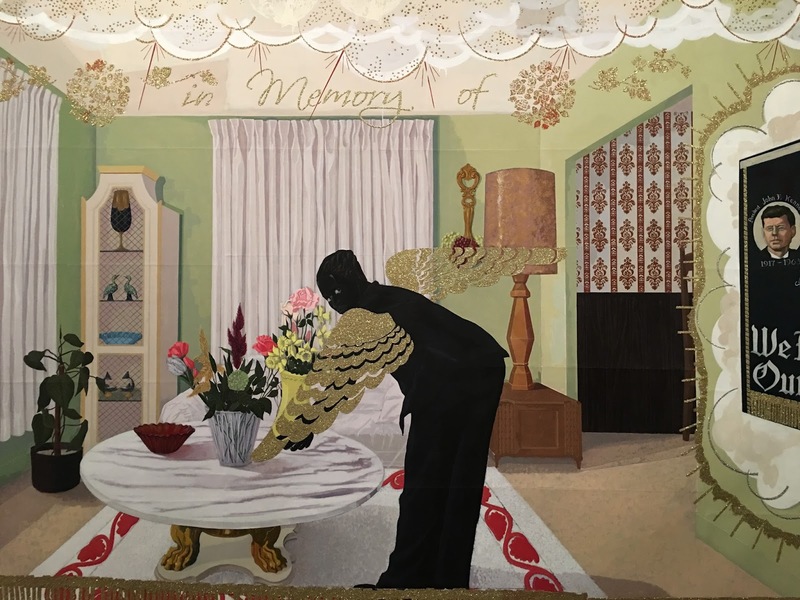 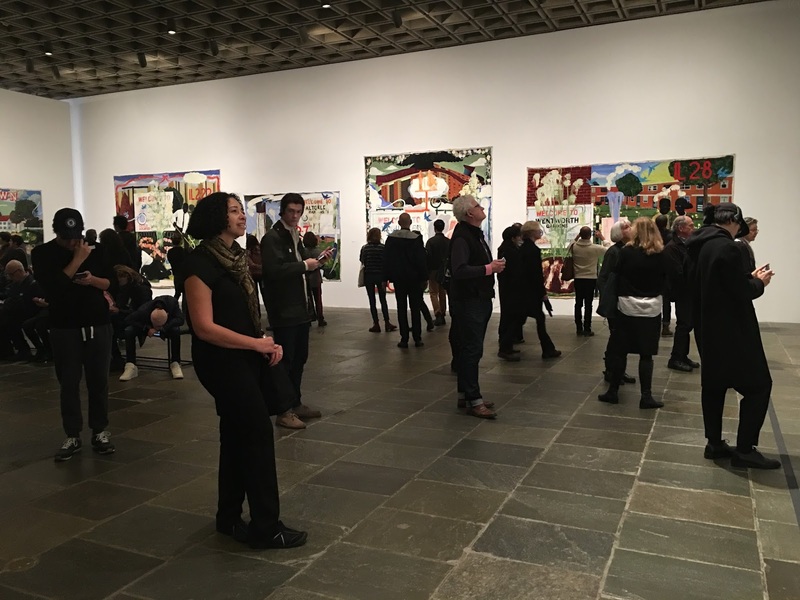 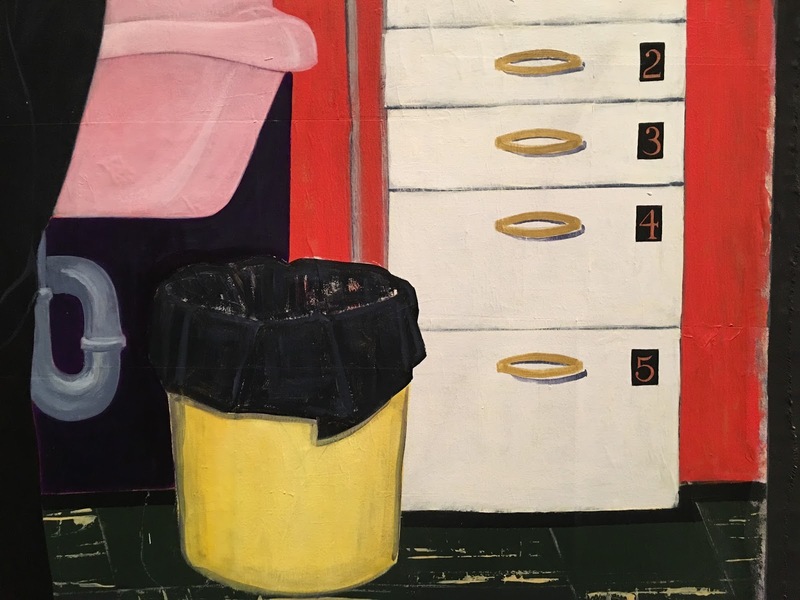 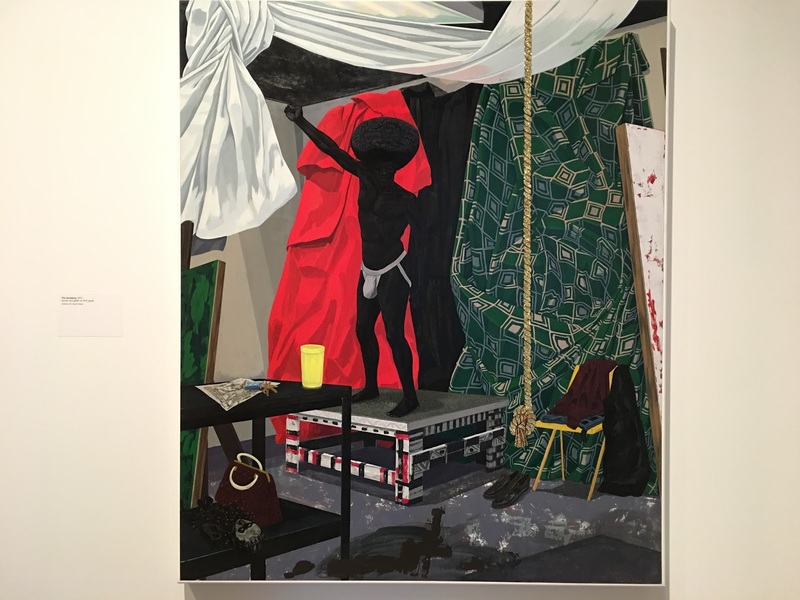 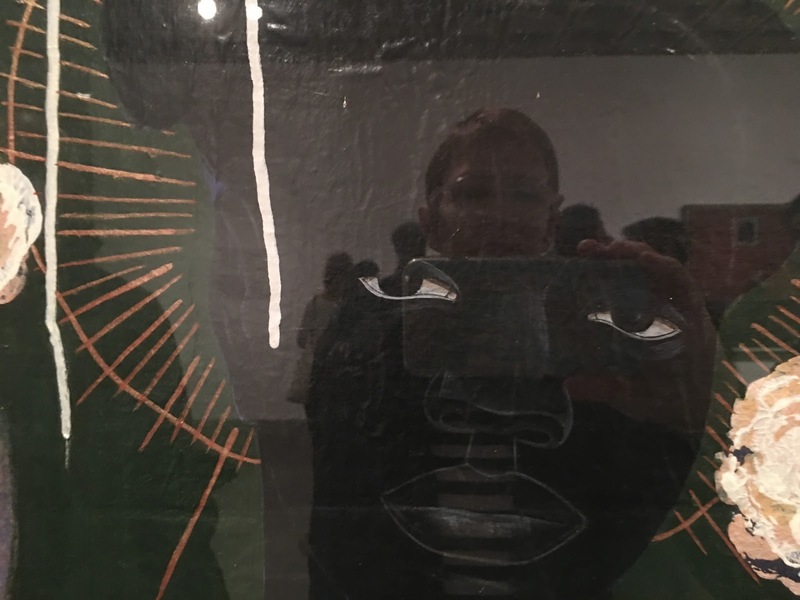 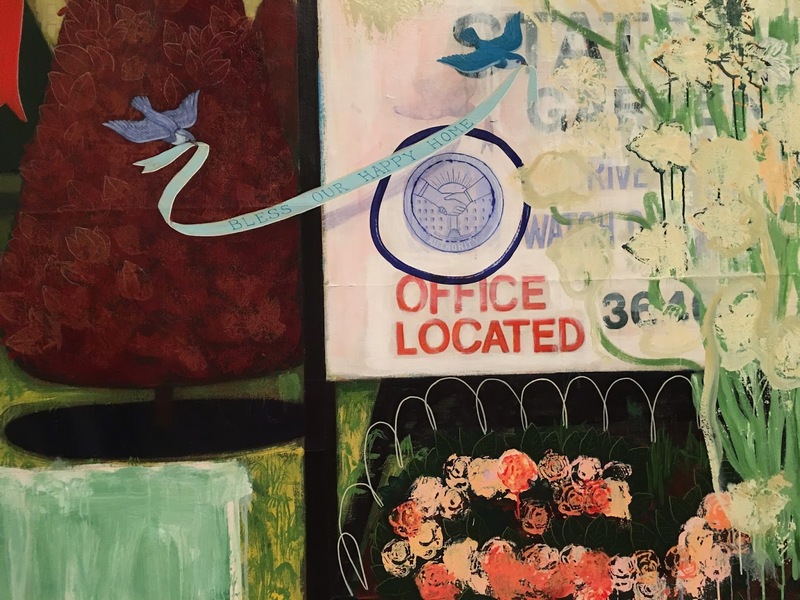 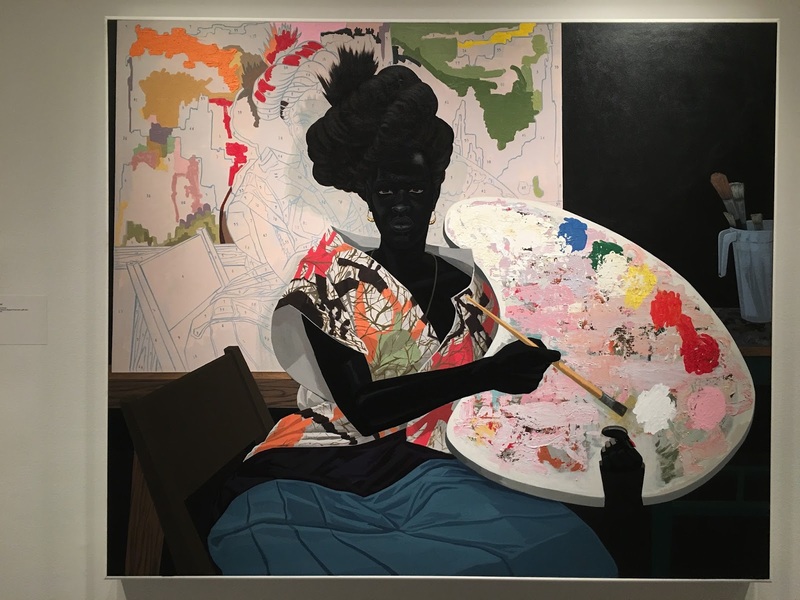 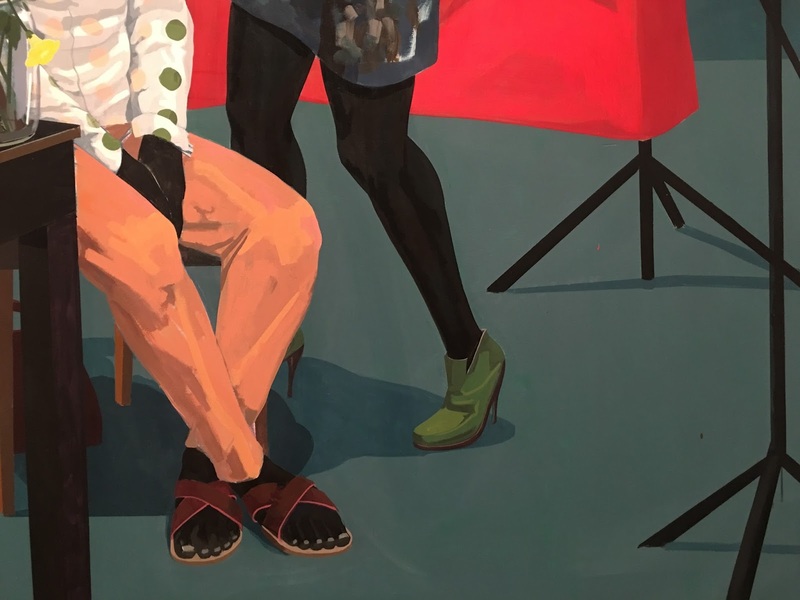 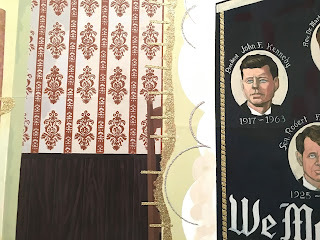 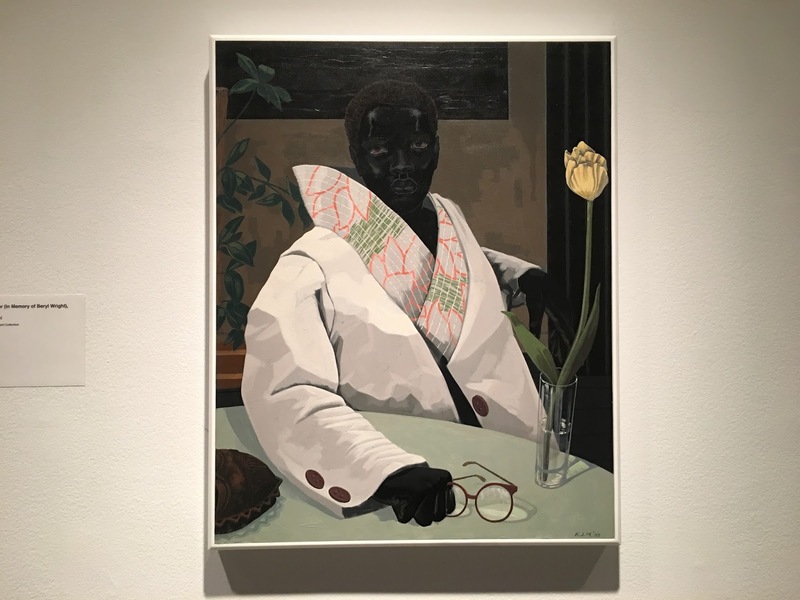 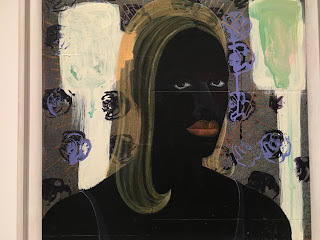 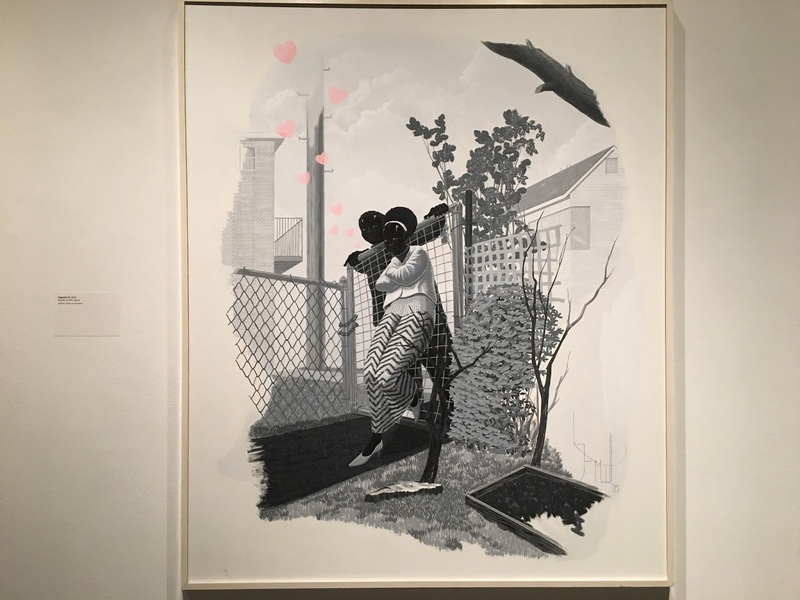 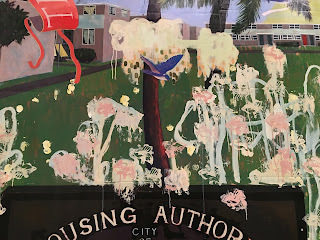 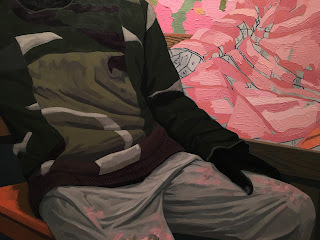 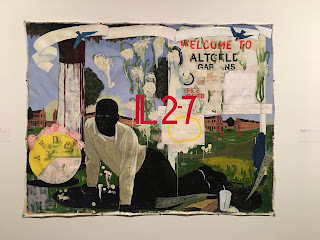 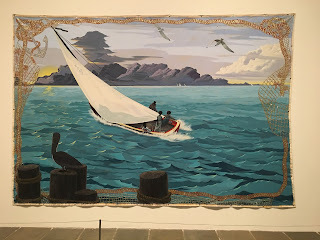 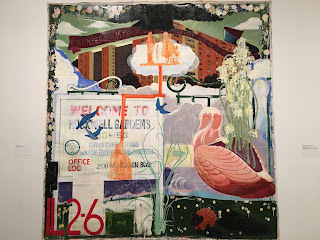 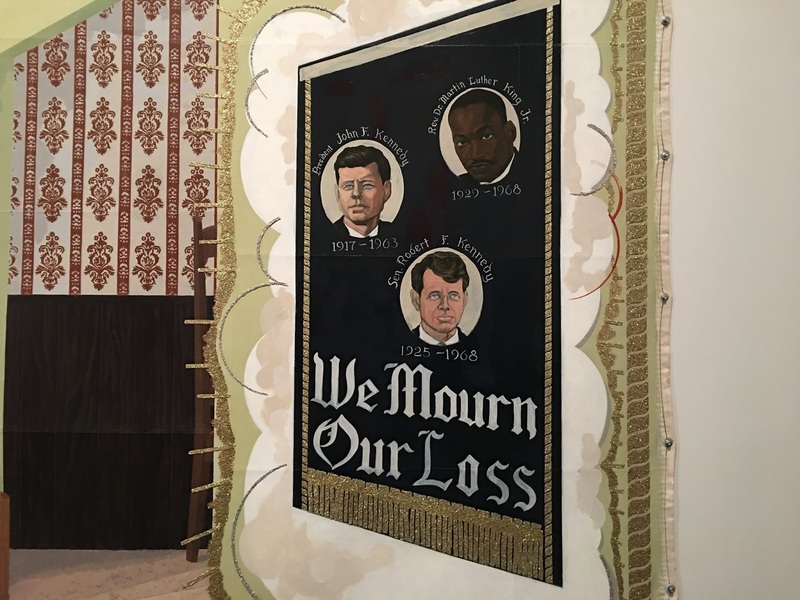 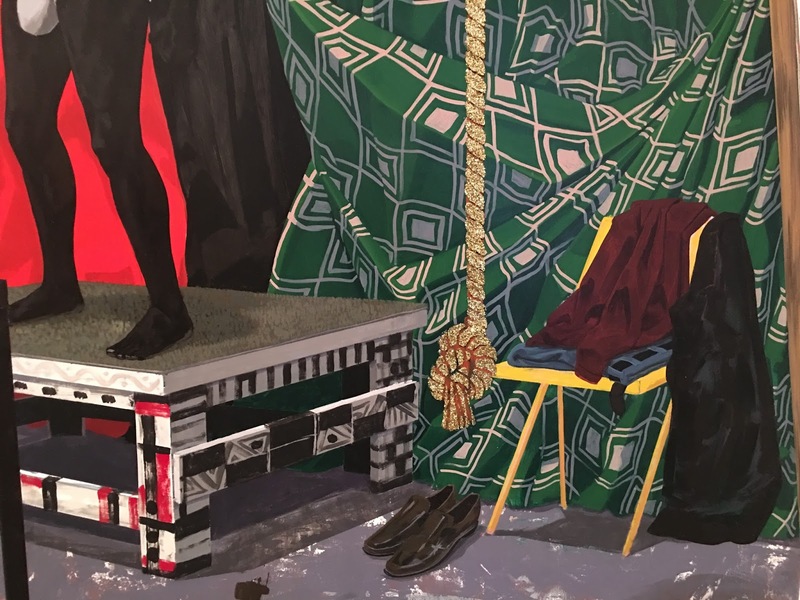 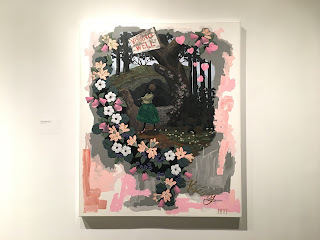 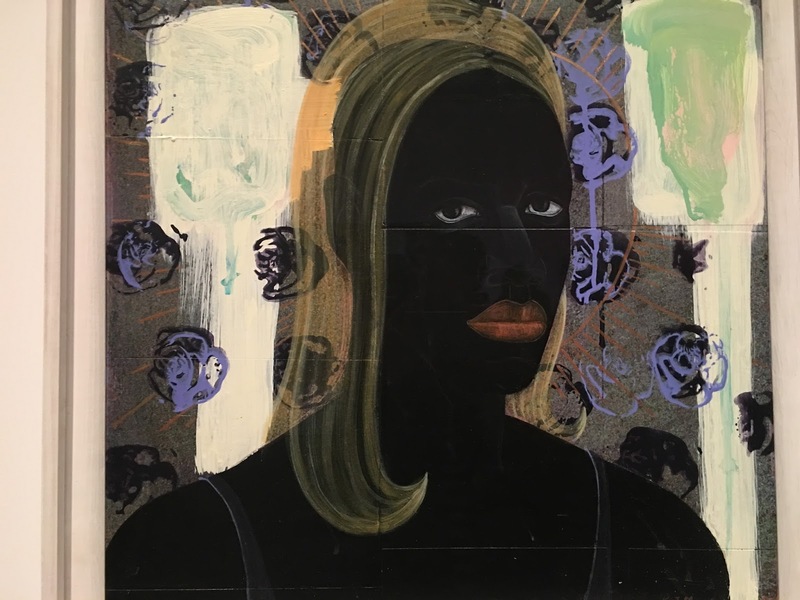 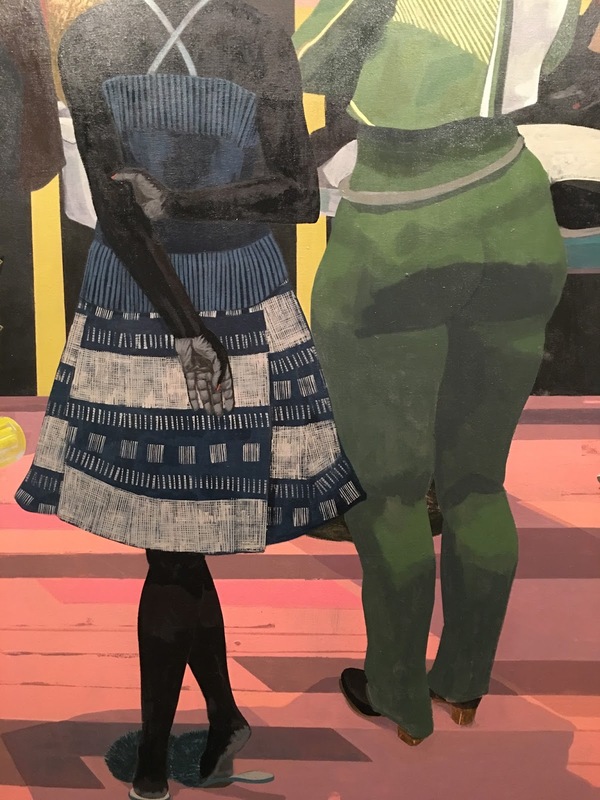 Since the 1993 Whitney Biennial when Kerry James Marshall showed large paintings on unstretched tarps of American families in the projects, I've adored his work. 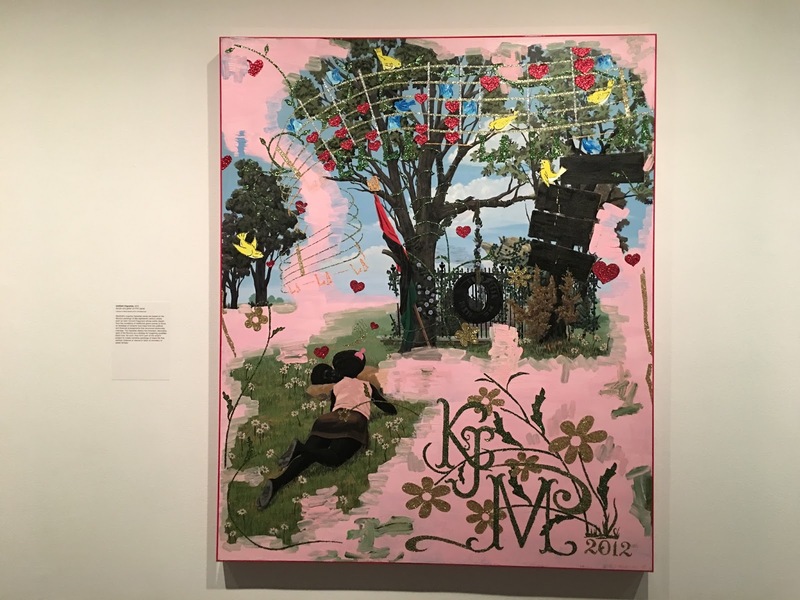 I didn't fully understand the reasons why until viewing the comprehensive retrospective Mastry. 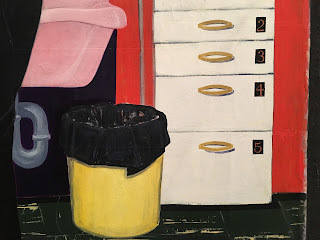 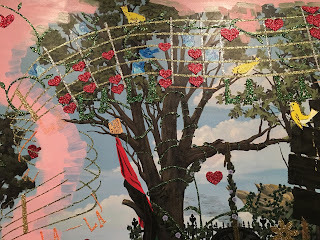 The exhibition infuses me with the pure state of inspiration that comes from well-honed visual thinking, a transmission of power from hand to eye that surges through the works in the show and sends the artist back to the studio post-haste. Crowds admiring the unstretched tarp paintings from the mid-1990s at Mastry. given his penchant for pink hearts and glittery signatures. 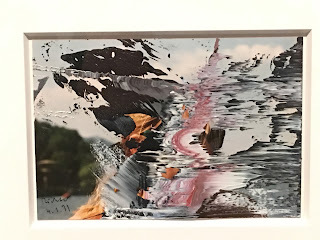 Or that's my reading, anyway. 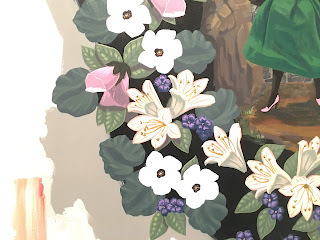 Vignette up close: flowers with glitter stamens, a vision close to my heart. 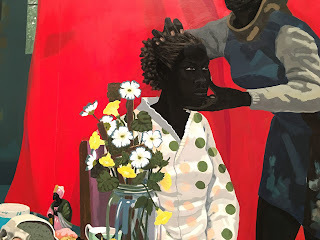 These paintings make me feel understood - and I understand them - generational motifs, perhaps, is part of that. 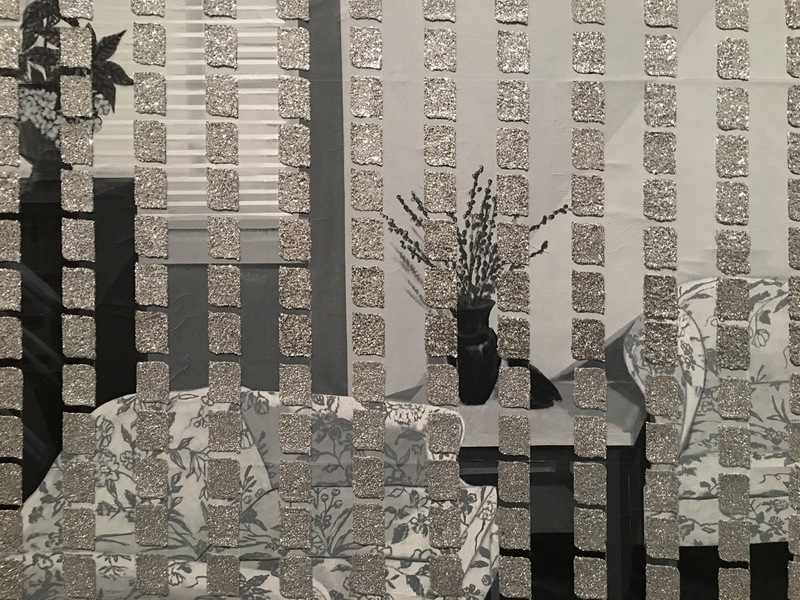 But also a privileging of sentiment, overt beauty in imagery perceived in high art as suspect, less than or Other for its decorative rather than structural content. 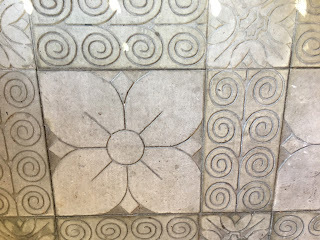 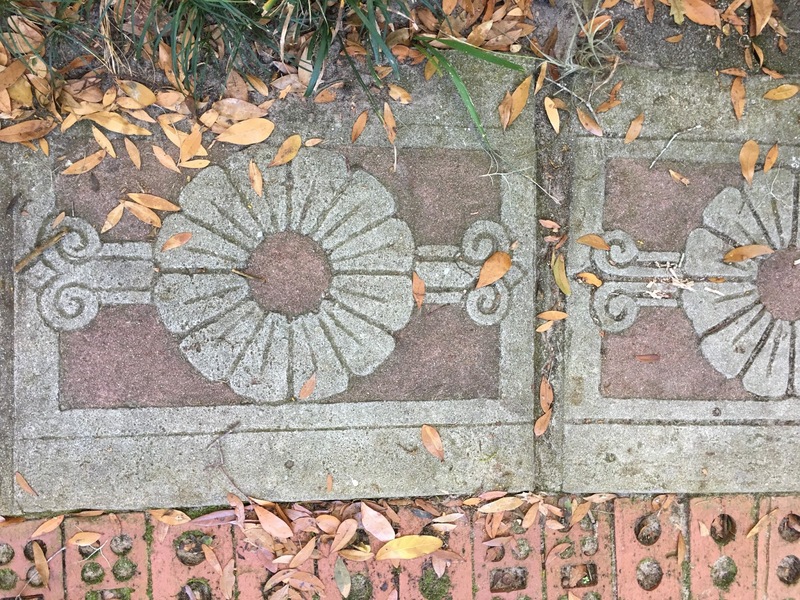 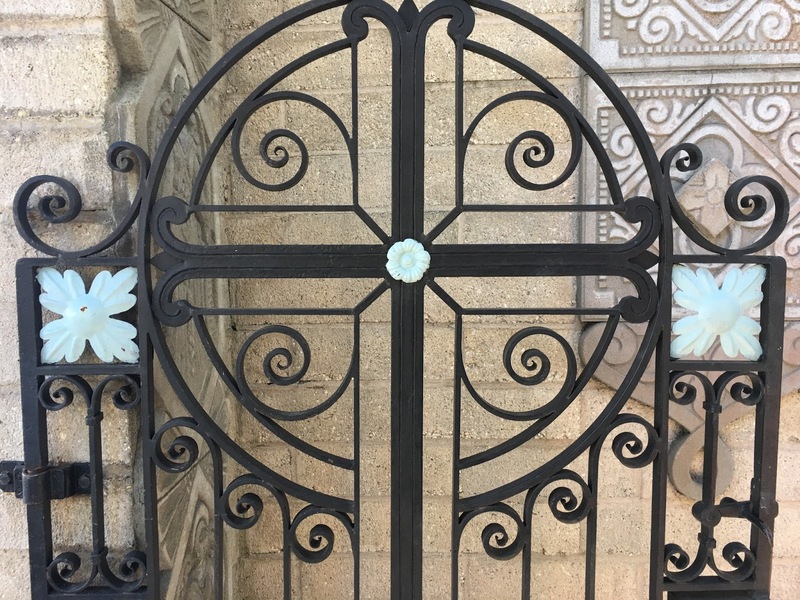 Like much else this is a construct, as we know that flowers can be structural, but in the Modernist grid of New York, the bias remains in visual terms. Graffiti, musical notes, composition from increasing dissonant elements, much like the world, and KJM puts it together. Working the full palette of painting history not to mention pop culture. 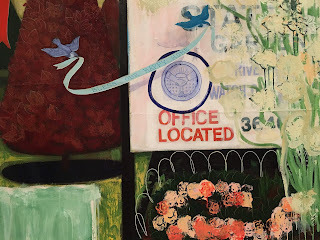 Infused with a healthy graphic sense, bird, flowers and glitter! 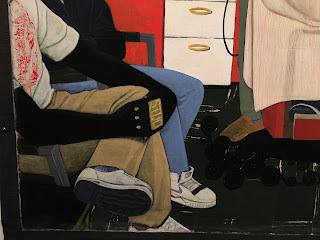 From 2014. 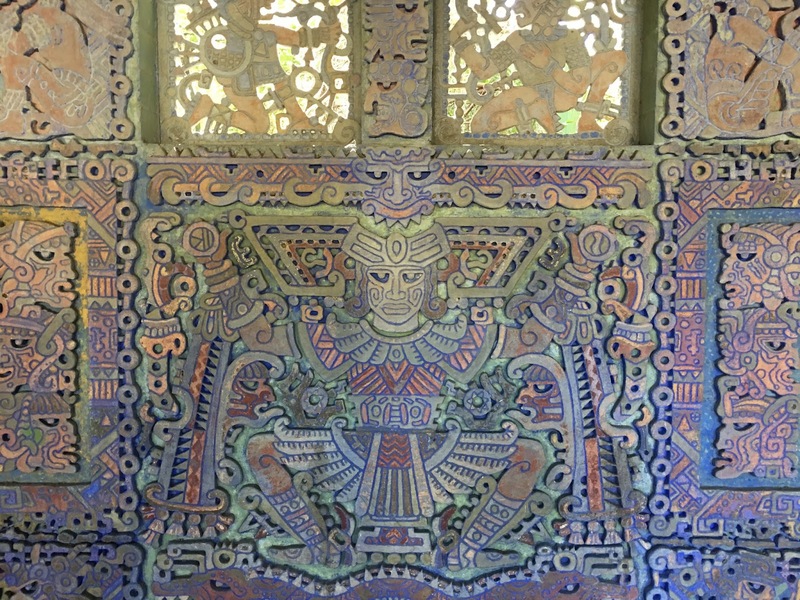 Large detail of a figure within interior. 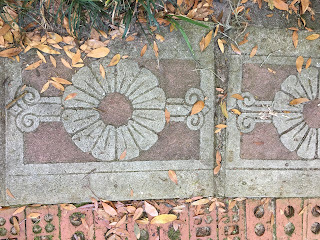 Beautiful veins of neutrals coursing through deep tones. 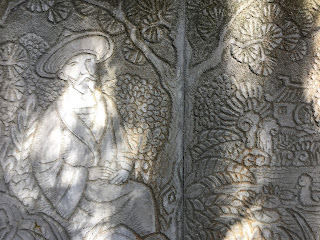 Here from a larger work, patterns and volumes are slabs, marks and daubs that form bodies in space. 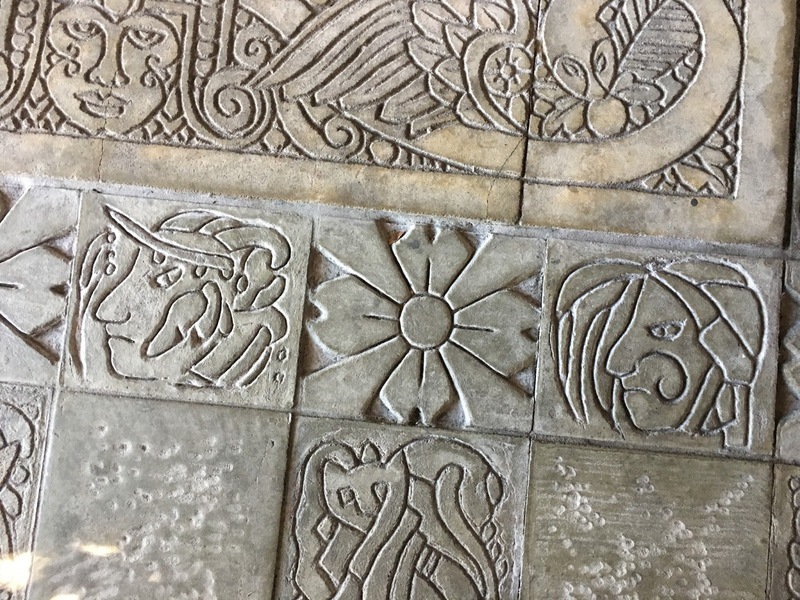 Anamorphic perspective, as in Holbein's Ambassadors (1533). 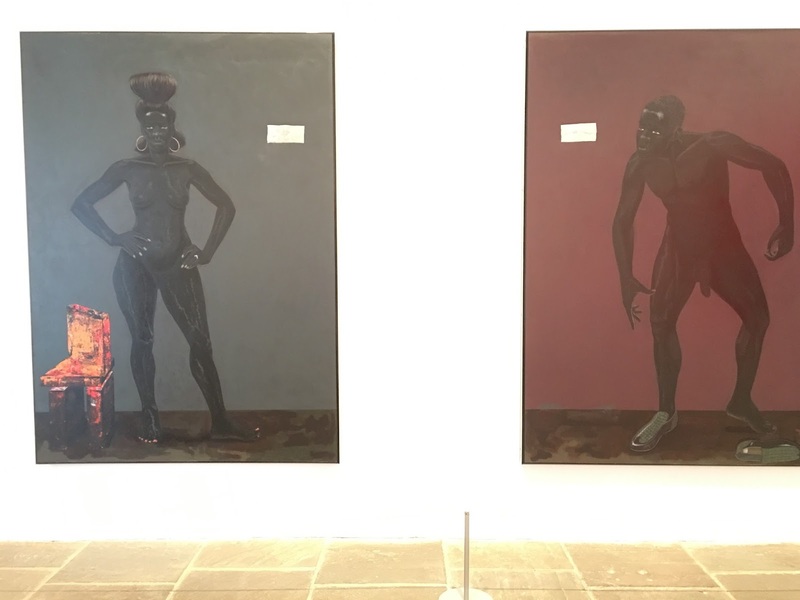 Wikipedia_Holbein's Ambassadors. 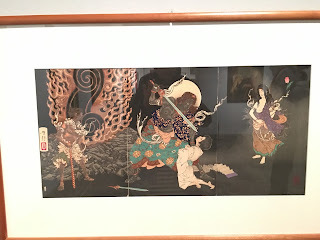 Not the skull of death as that painting, but a cultural whitewash, which the baby ditched his rattle for to investigate. 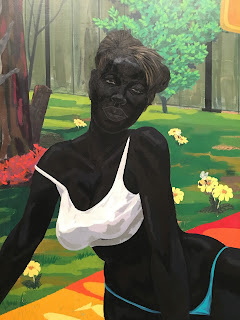 Color: the subtle tones of skin and in this instance, surrounded by a bright, loud landscape. 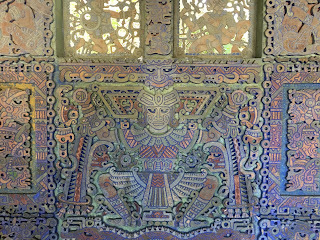 The whole vignette, parts of which were shown above. 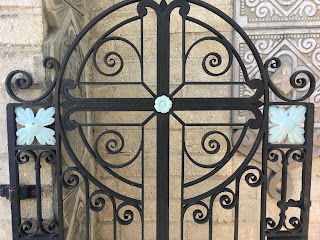 Circling back. 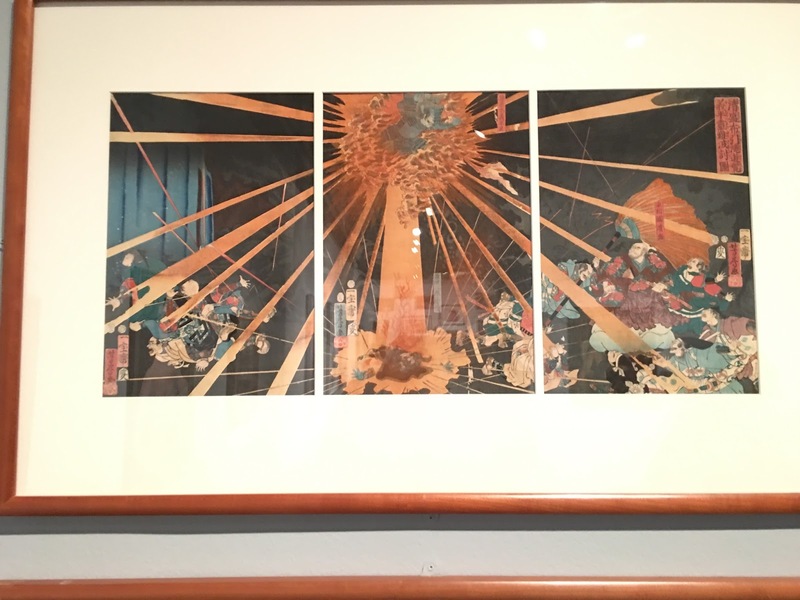 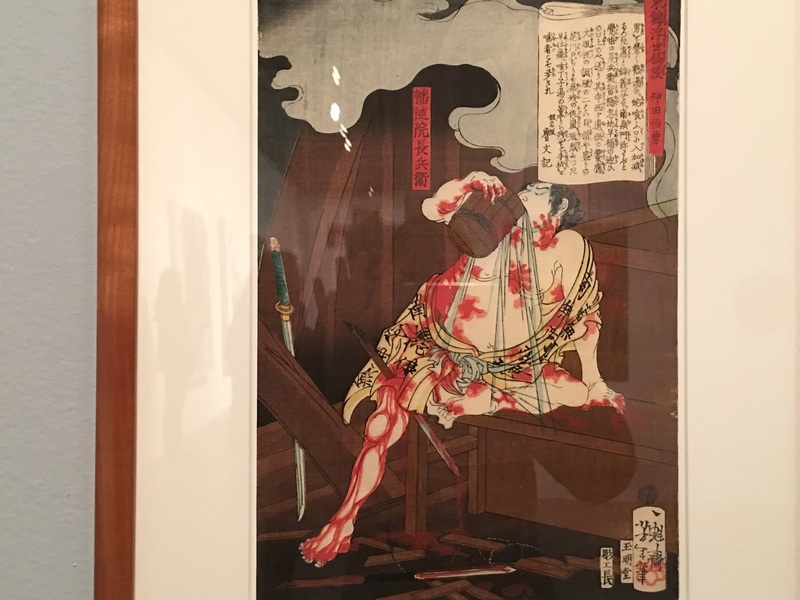 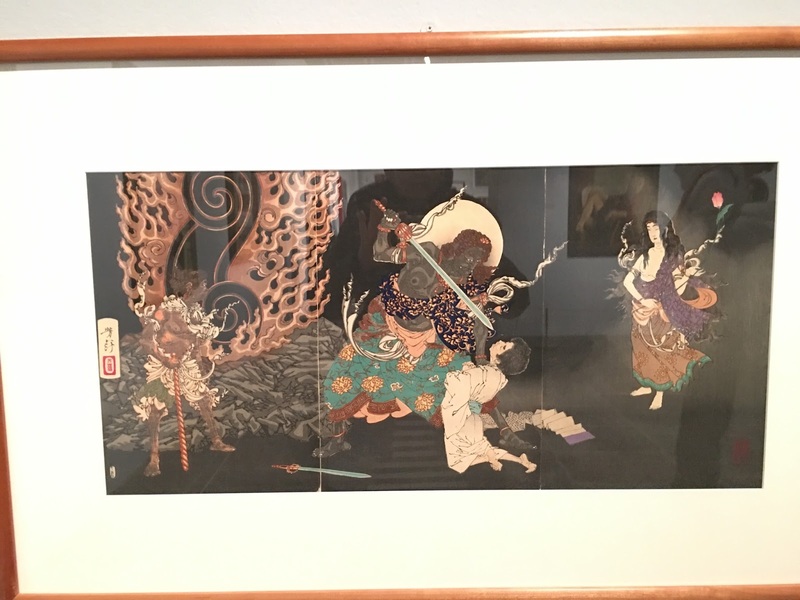 Japanese prints selected by Marshall from the Met's collection as inspirational sources for his own work. 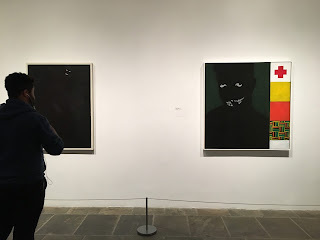 As an aside, he also chose Matisse. 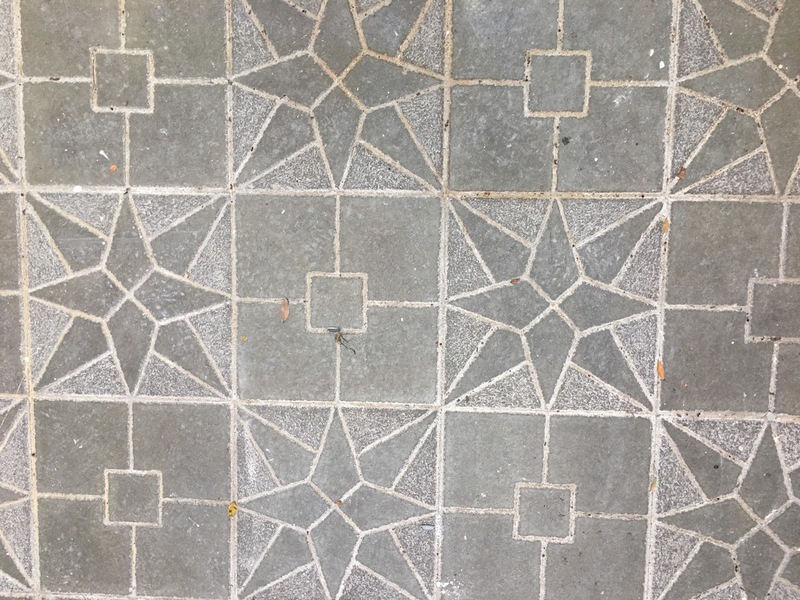 What is not to love! 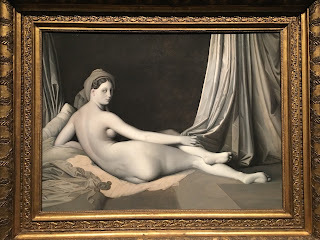 And Ingres' Odalisque in Grisaille, 1824-34. 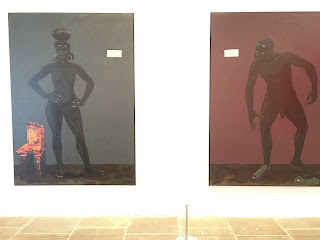 These do provide insight into his oeuvre. 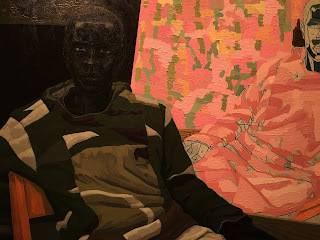 KJM often paints on paper assembled together as if identity were constructed - also playing against the elegance of his drawing in this self portrait. 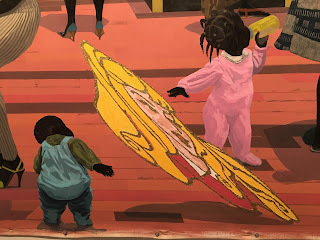 Kids at play in the world. 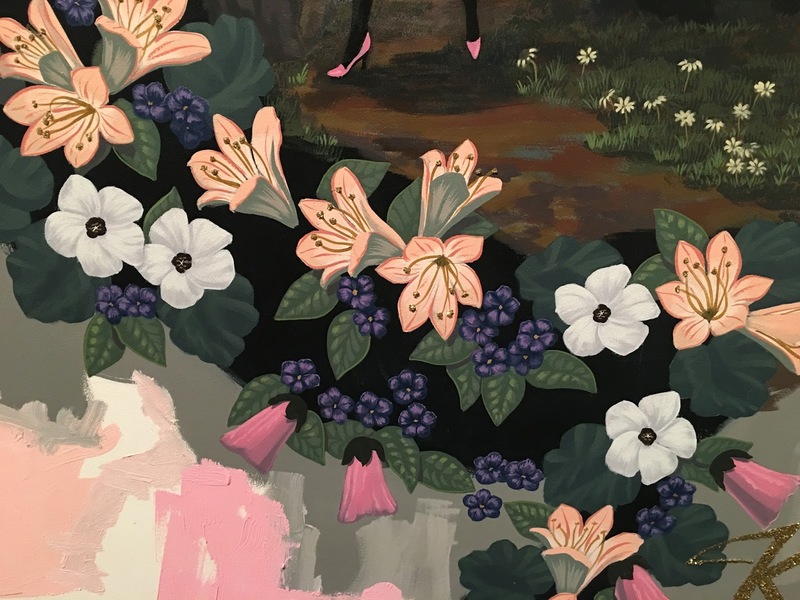 Motifs arise and repeat, like pink thongs. They don't pretend something doesn't exist, but include everything. 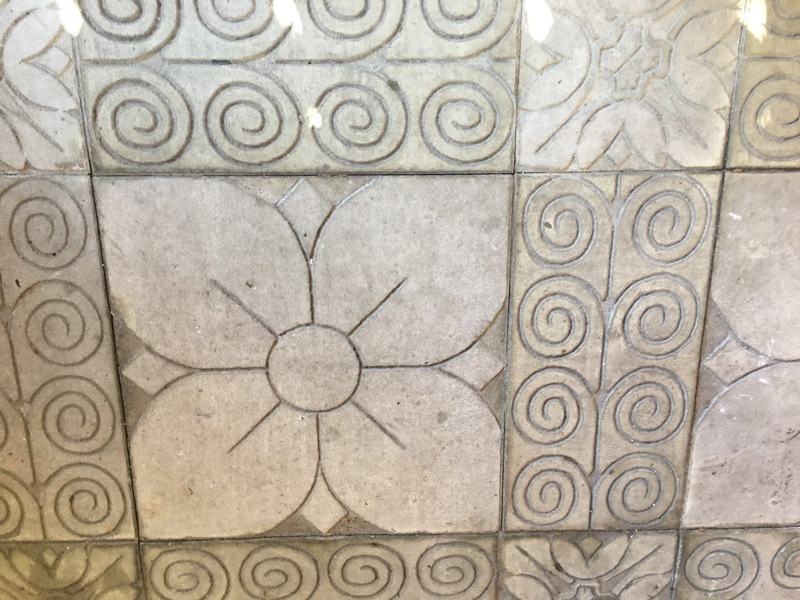 I could get lost in that floor, in those toes, and the light stands. Something I saw for the first time in Mastry: Chicago influence - a la Ed Paschke in this neon backdrop. 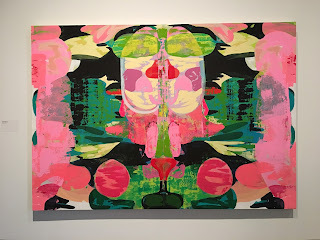 Marshall lives in Chicago, but I had never identified the Imagist influence in his work before. 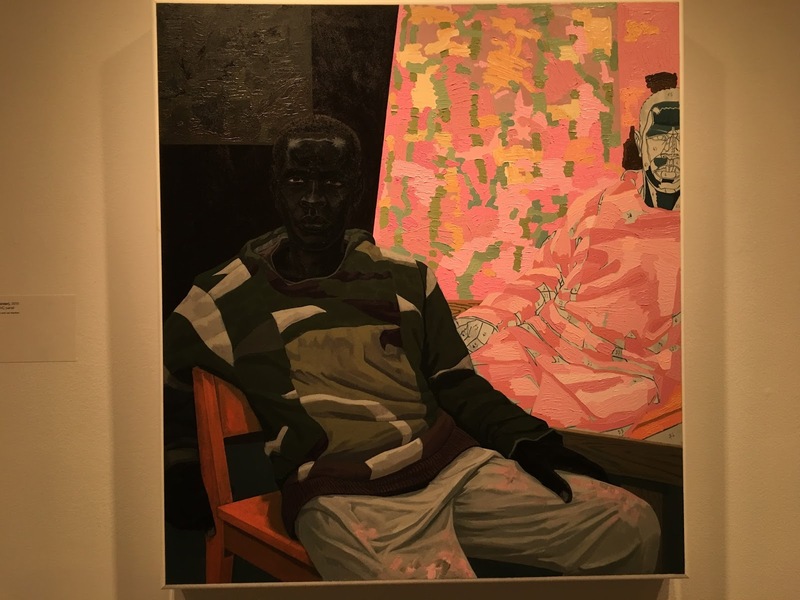 This beautiful palette shares a precision and tonality with Jim Nutt's portraits. Close view of Frankenstein and Mrs. Frankenstein - the flip side to KJM's childhood paintings. 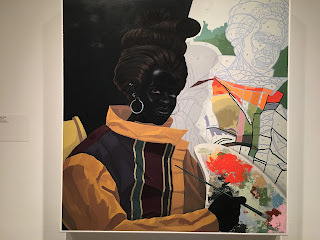 really portraits of ow a painting is made, layer by layer, color by color side by side...assembled, built, constructed and realized. 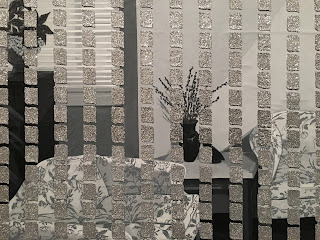 How sometimes it can feel like paint by numbers, while other times it's magic improvisation. 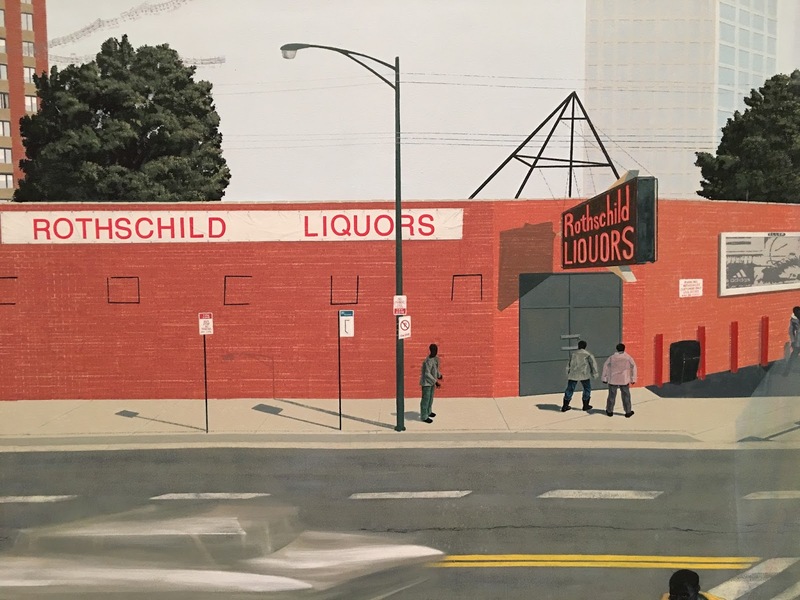 And another mural-sized painting of Chicago's South Side, in full below. 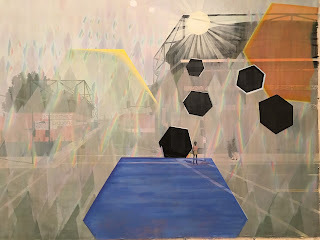 Here, a detail showing prisms caused in camera. 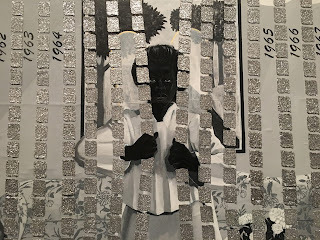 Emerging from the black and white world. The glitter, the outre design elements, flowers, bodies - adolescent castaway identity - belongs to men and women. 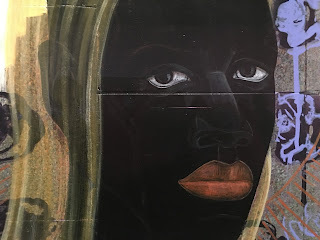 But I don't forget the women. 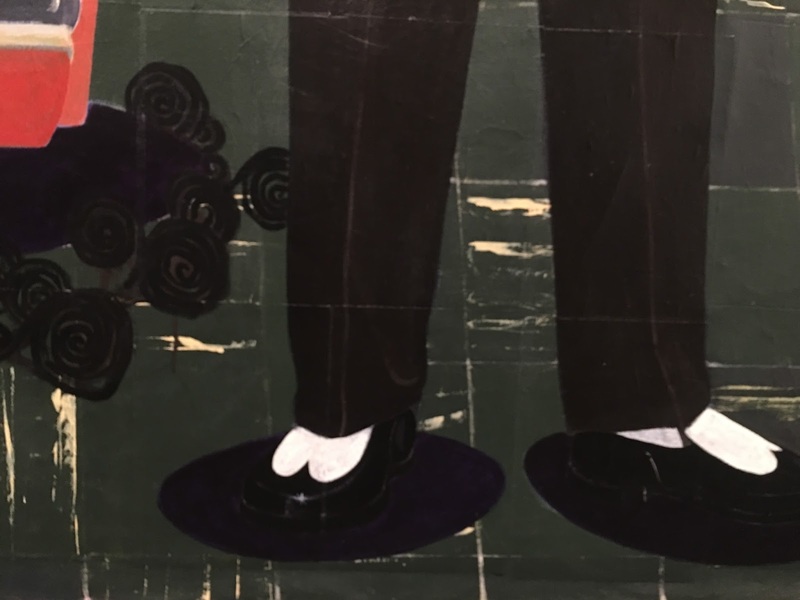 In The Sympathizer, Viet Thanh Nguyen writes, "Now a guarantee of happiness--that's a great deal. 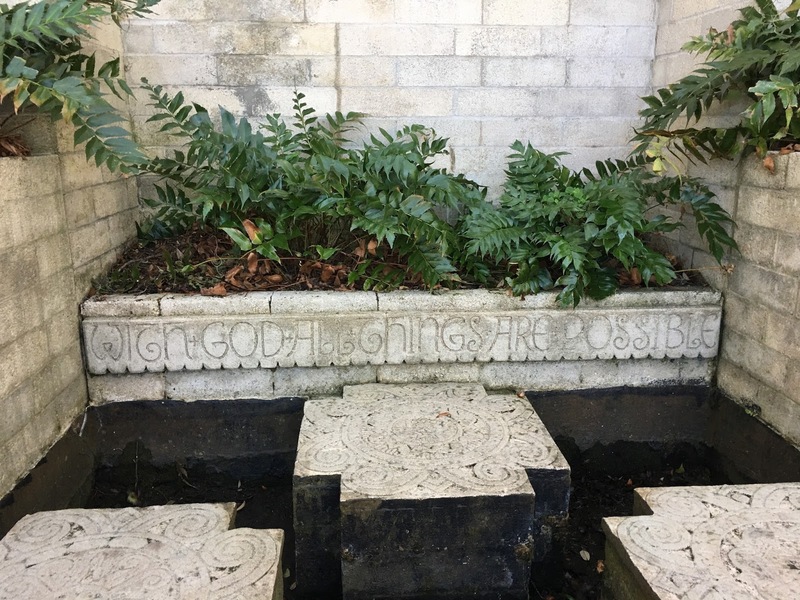 But a guarantee to be allowed to pursue the jackpot of happiness? Merely an opportunity to buy a lottery ticket. Someone would surely win millions, but millions would surely pay for it." 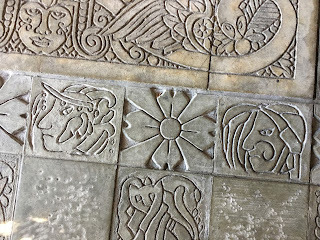 Mastry is funny and Mastery achieved. 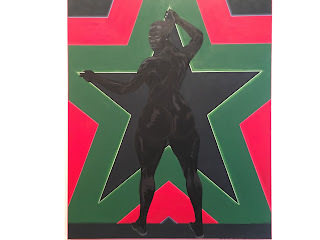 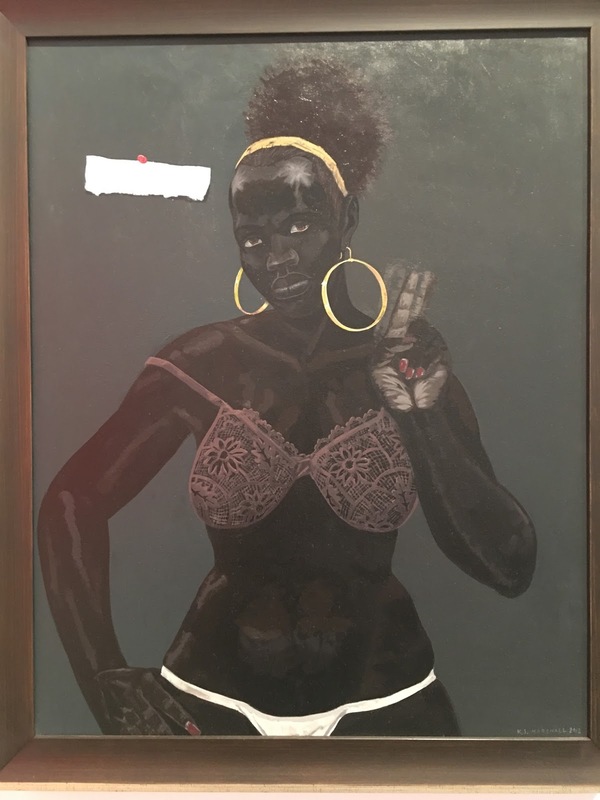 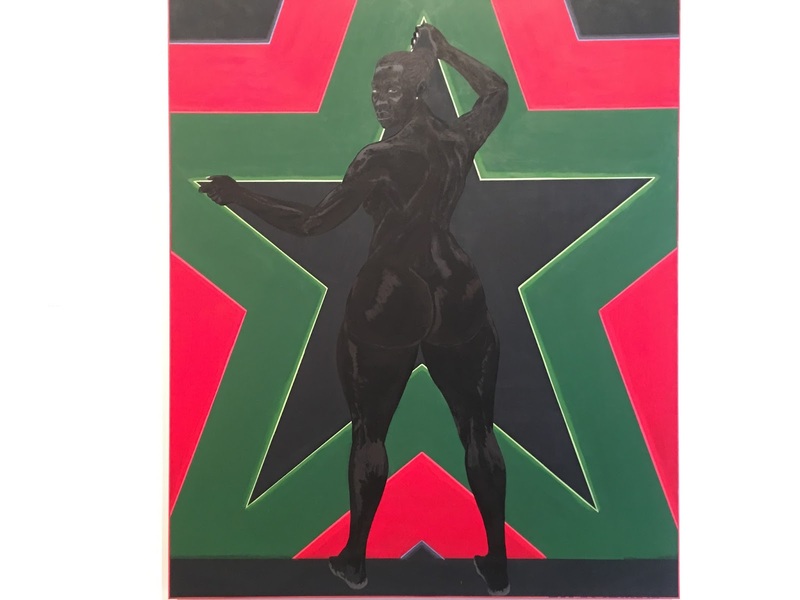 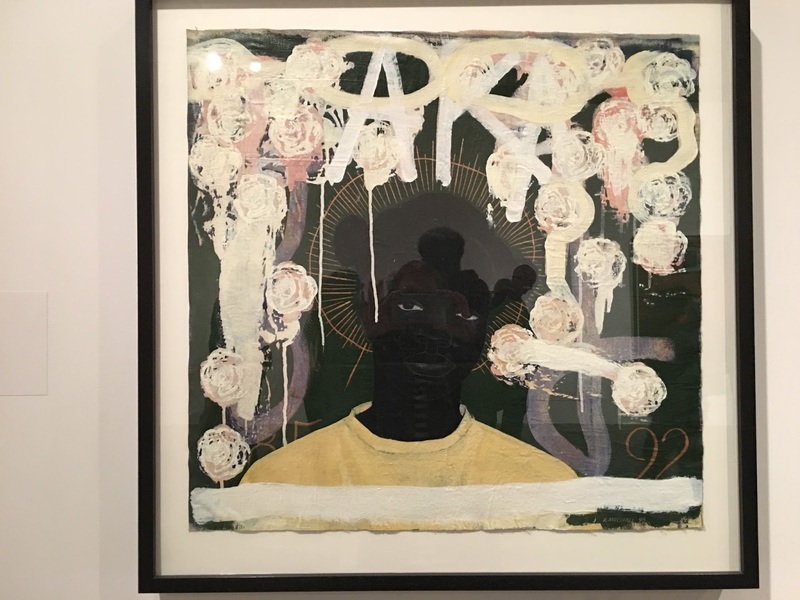 Congratulations to Kerry James Marshall for one of the best museum shows ever. 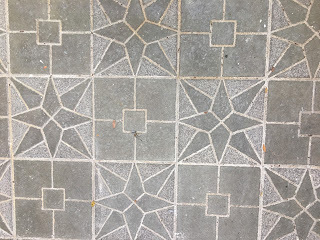 It's sublime - and pointed, too.